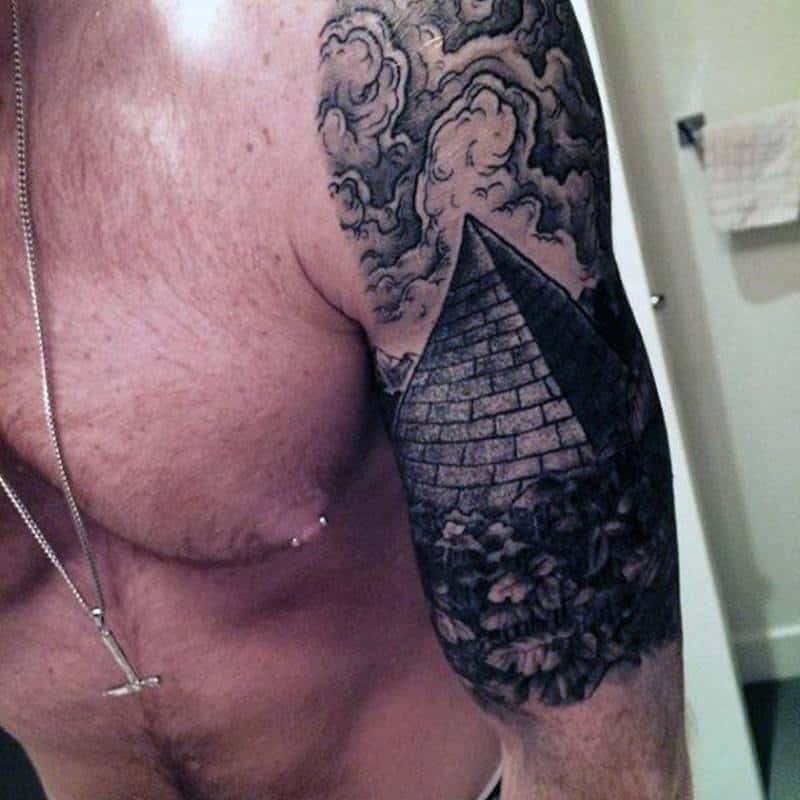 The pyramid tattoos are gorgeous and mysterious and that’s because there is a lot of history behind them. 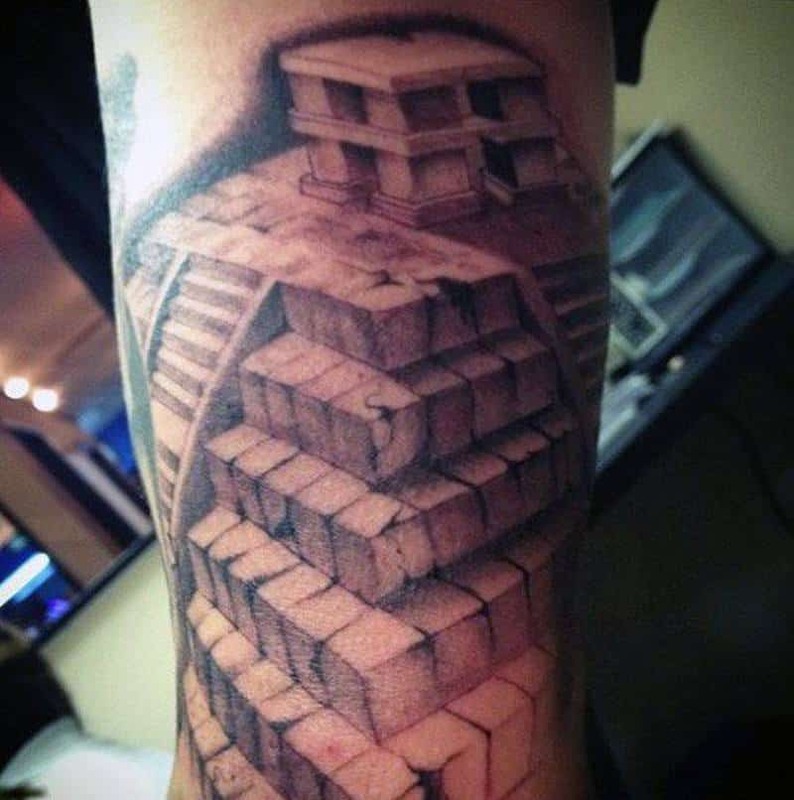 Not only has the pyramid been considered the “stairway to heaven” but it’s seen as a symbol of strength because of all the years it’s endured. When there were Egyptian rulers, these people were seen as Gods and the pyramid were there to represent their ascent to heaven. 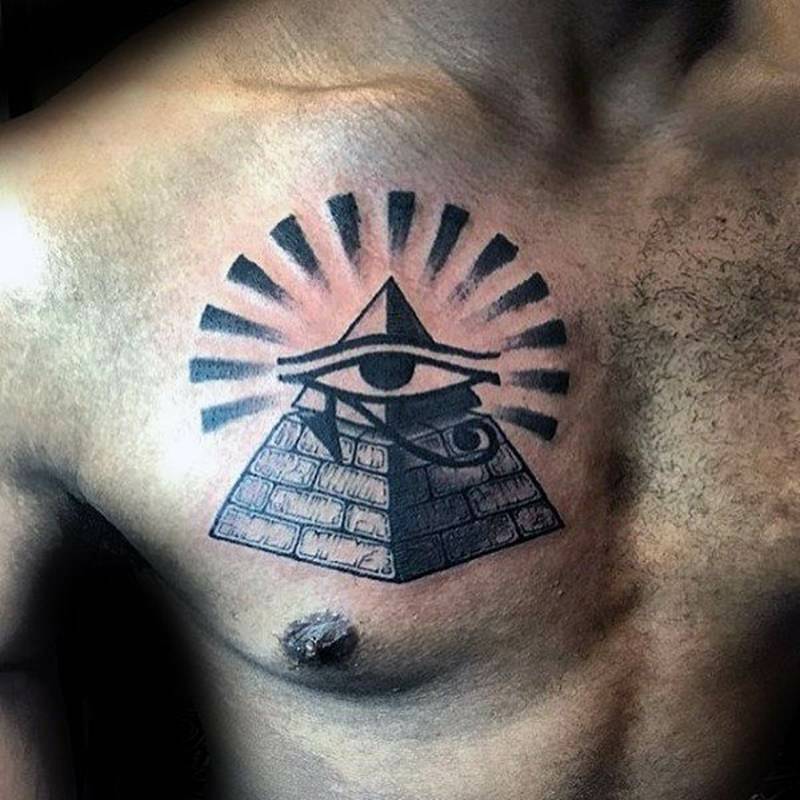 We often see the All-Seeing Eye in pyramid tattoos as well and it’s seen as the Eye of Horus looking over you with protection. Pyramids are seen as a spiritual symbol and there is a lot of mystery surrounding the time when pyramids were being built. There is a belief that the pyramids hold electromagnetic energy from the planets and stars. They were built in medieval times and yet they are still standing strong and durable. It is said that pyramids were built all over the world, not just in Egypt. There are some people that suggest there are still pyramids that haven’t been discovered yet. 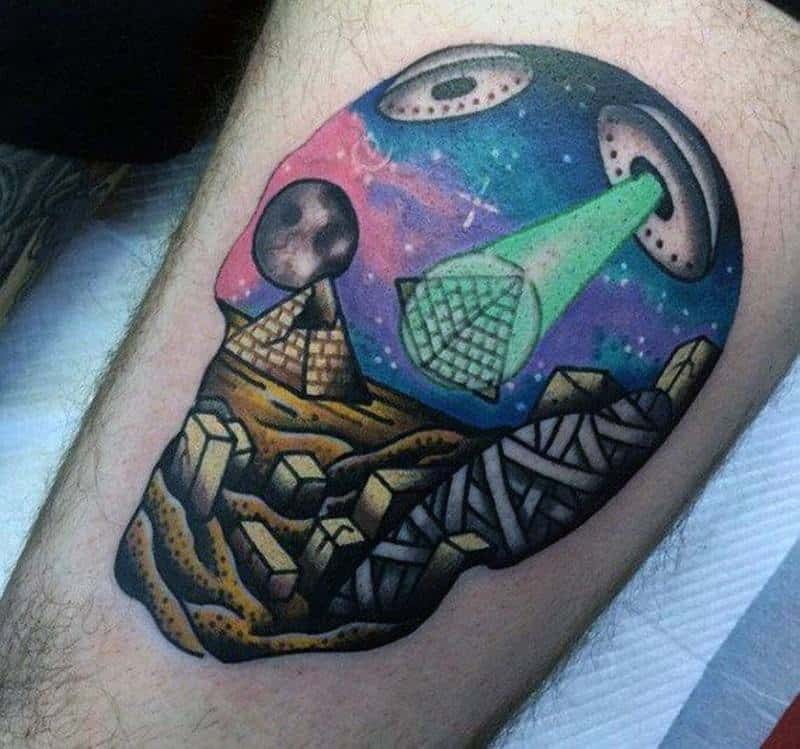 It is believed that there is an energy field that surrounds pyramids that allow people to connect with other spiritual dimensions. This is a rather large tattoo but as we mentioned before there is a lot of mystery behind these designs and this is a great example of one. 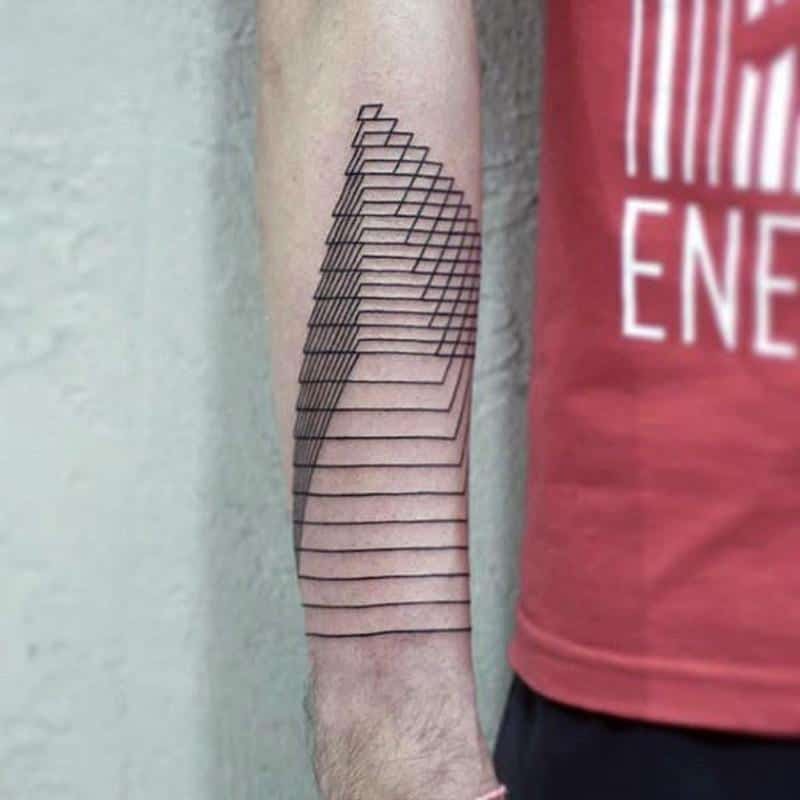 A cool design that has the pyramid separating in a cool way. 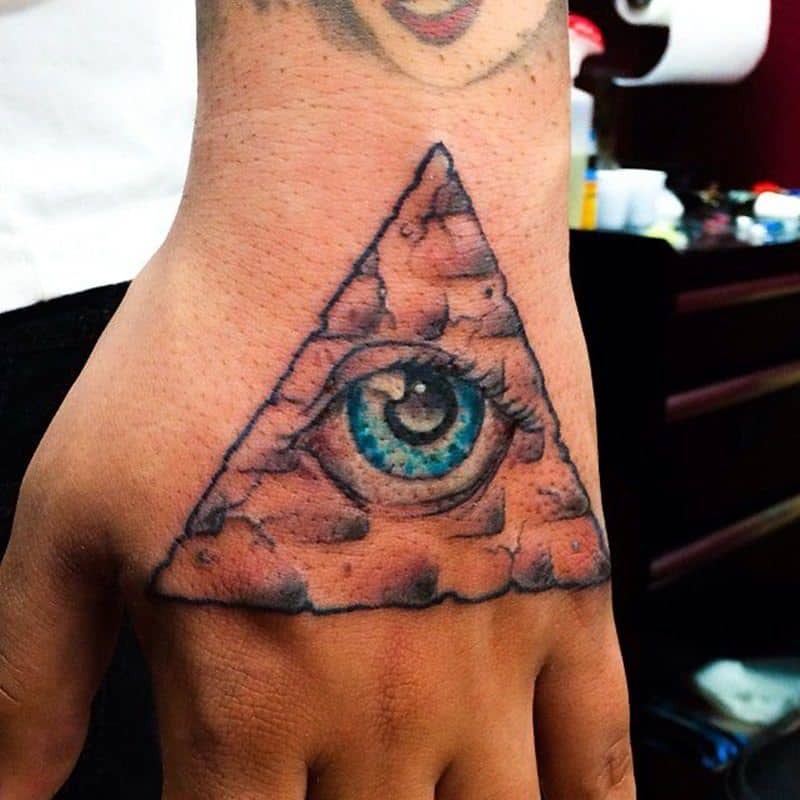 It also has a very large eye that is probably symbolic of the All-Seeing Eye. A cool look like this is for someone who likes to play around and have some fun. 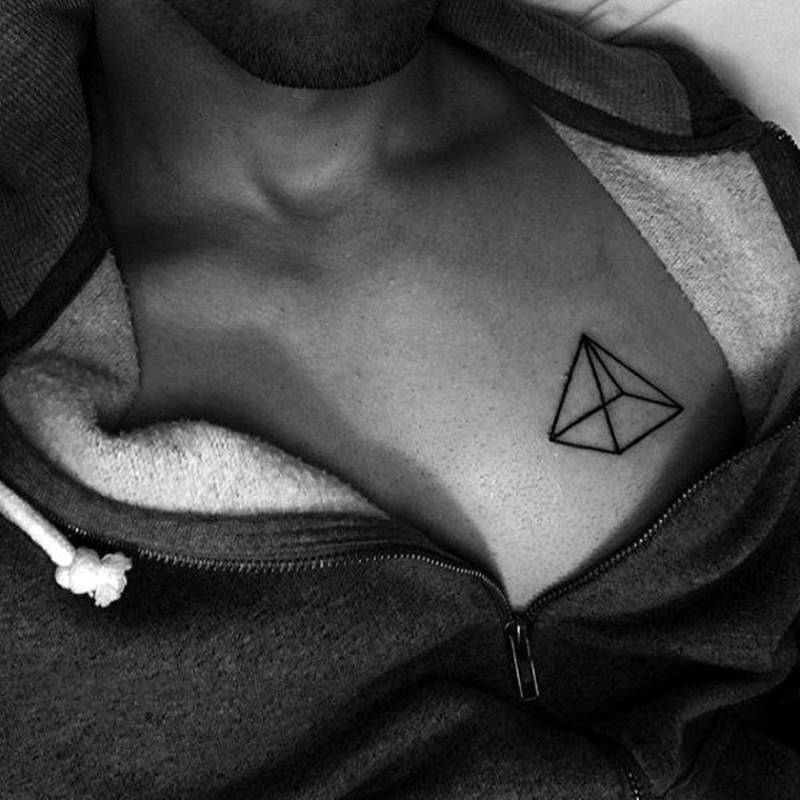 This is a geometric tattoo which is perfect for the pyramid styles. There are peace symbols surrounding the pyramid so it could be symbolic of peace during war times. 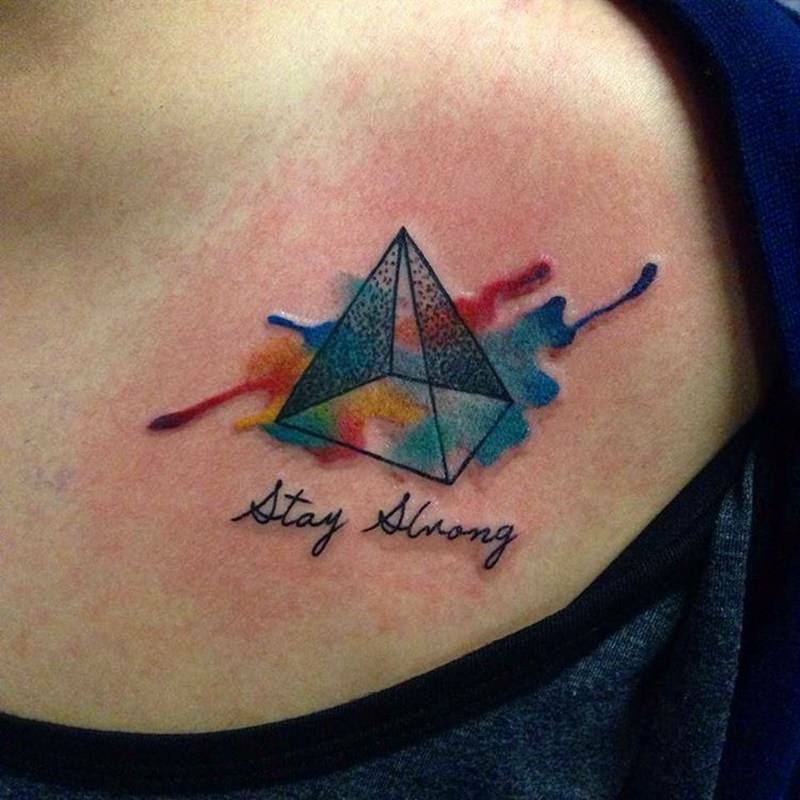 Watercolor tattoos are one of the prettiest styles that you can find. The colors are always amazing and you don’t have to worry about staying inside the lines. 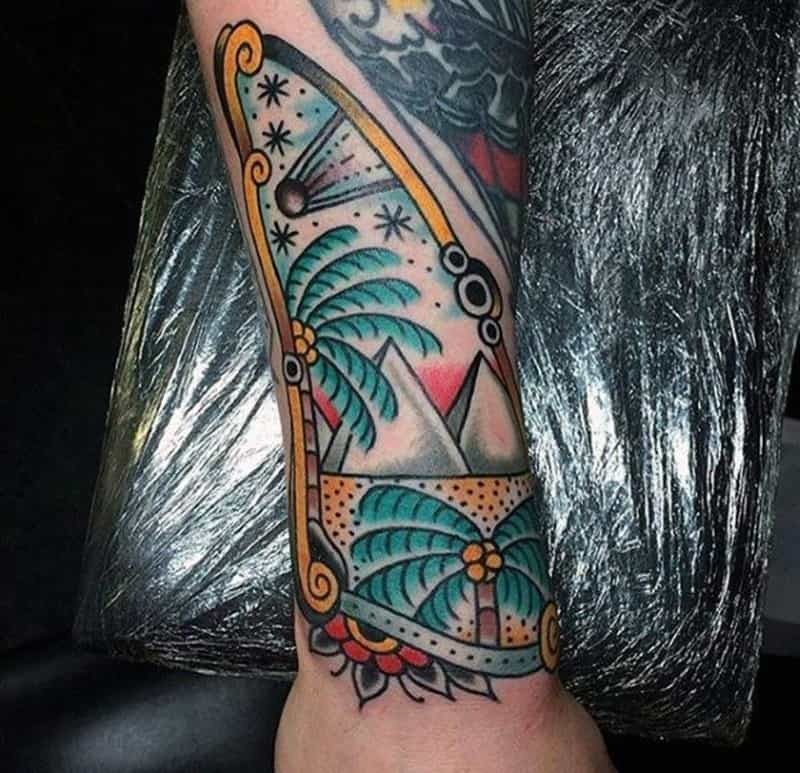 There is a lot that you can do with sleeve designs and as you can see here, you can incorporate a lot into your tattoo design. 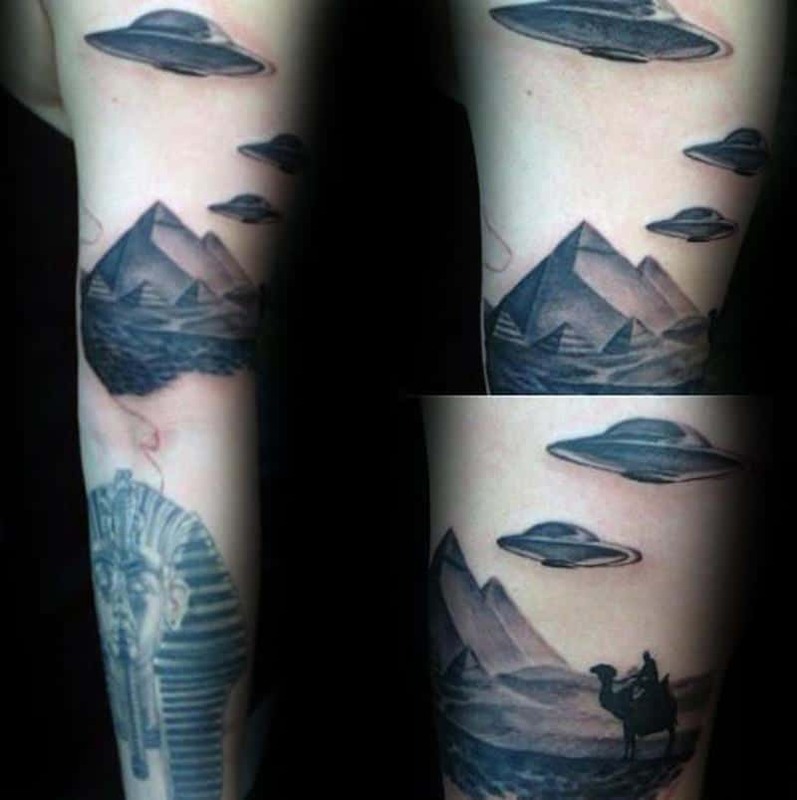 We have aliens coming down to the pyramids in this tattoo design. 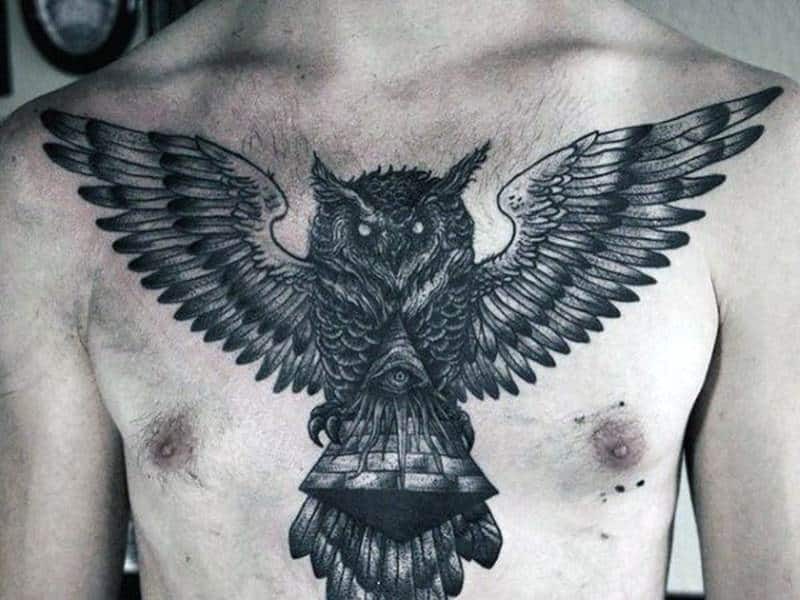 This is a dark tattoo design and one that you are sure to love. There is a lot going on with this design. 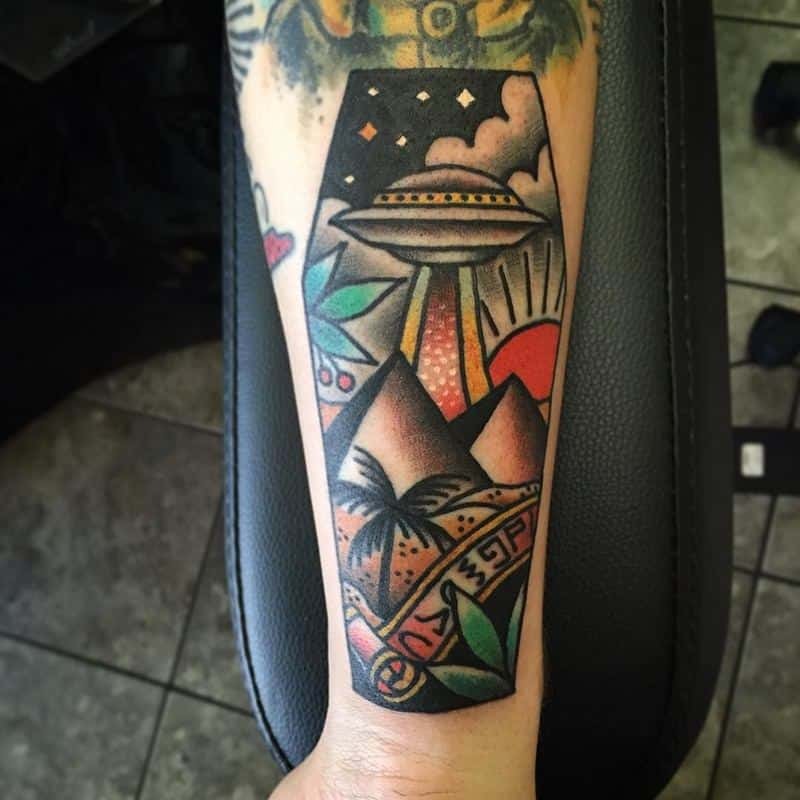 We have palm trees, alien ships, sunsets, it seems as if just about anything has been thrown into this style. 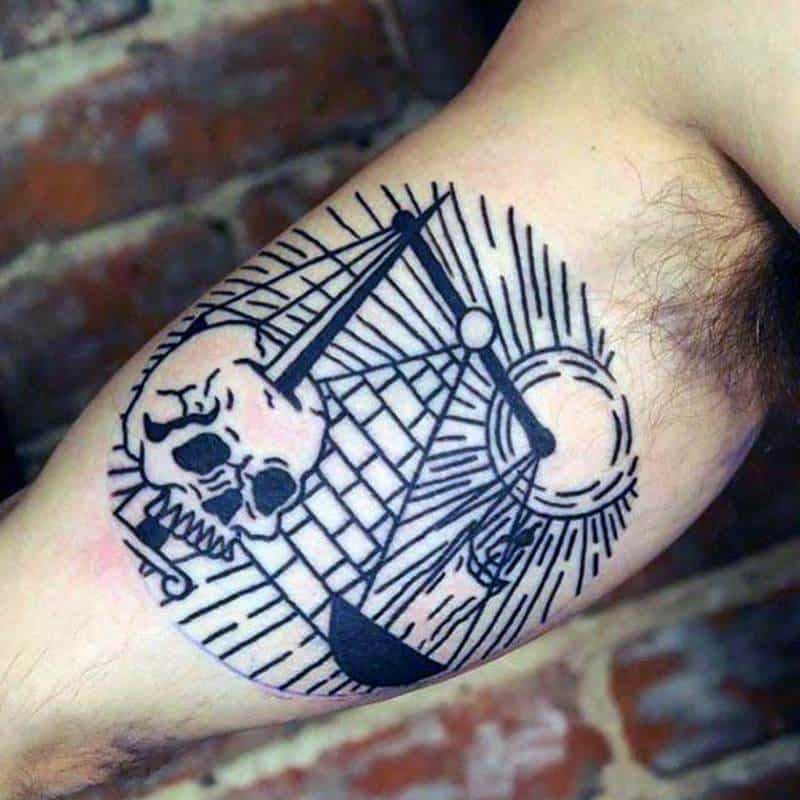 It seems as if there are just lines and dots bringing this tattoo design together and we love it. 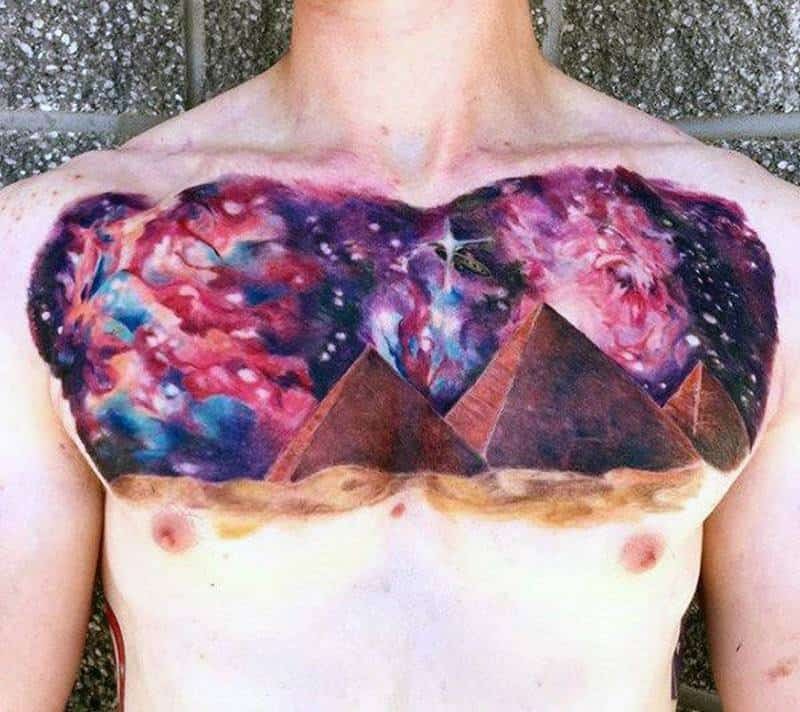 This tattoo looks more like a painting than anything else. 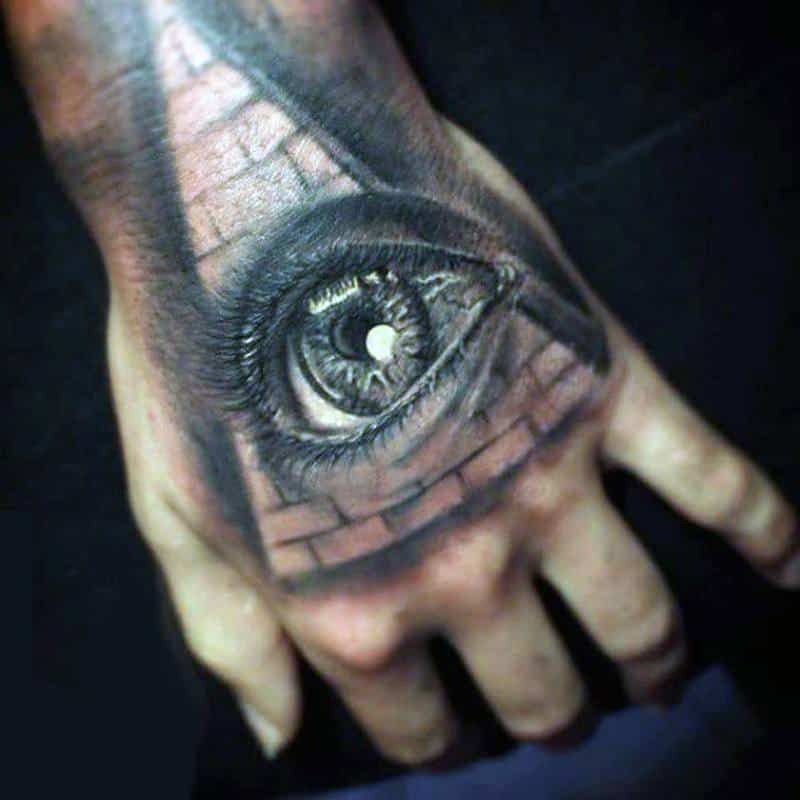 A great tattoo design of the All-Seeing Eye and it’s certainly a popular style. This is a large design and it covers the entire back. 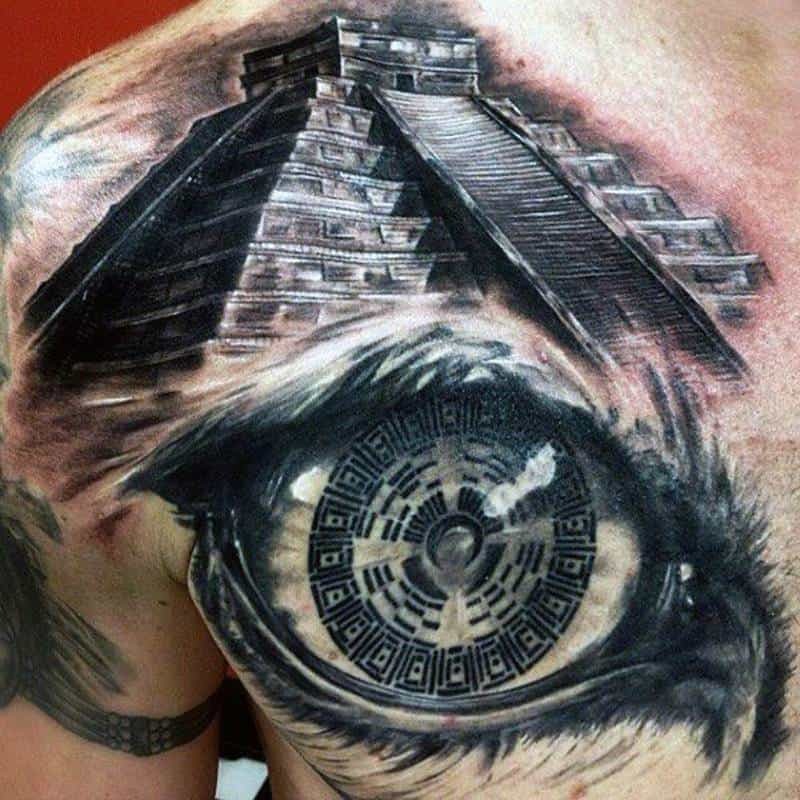 It’s a very detailed image of a pyramid. 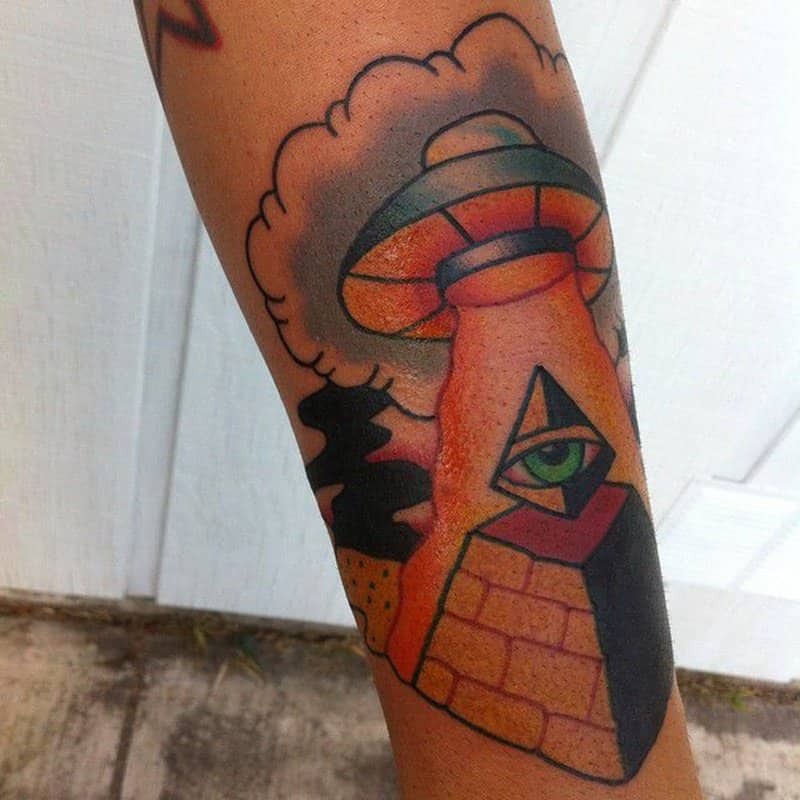 It’s obvious that there is a story behind this tattoo and it definitely involves aliens. 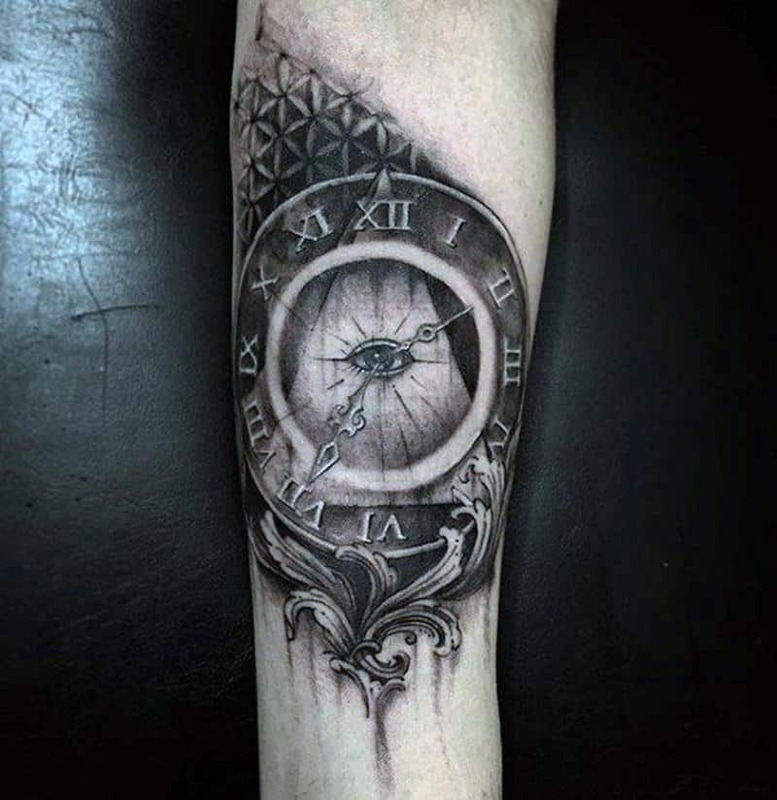 A stunning tattoo design that has a ton of detail. We have time within the pyramid and that could mean a number of things. 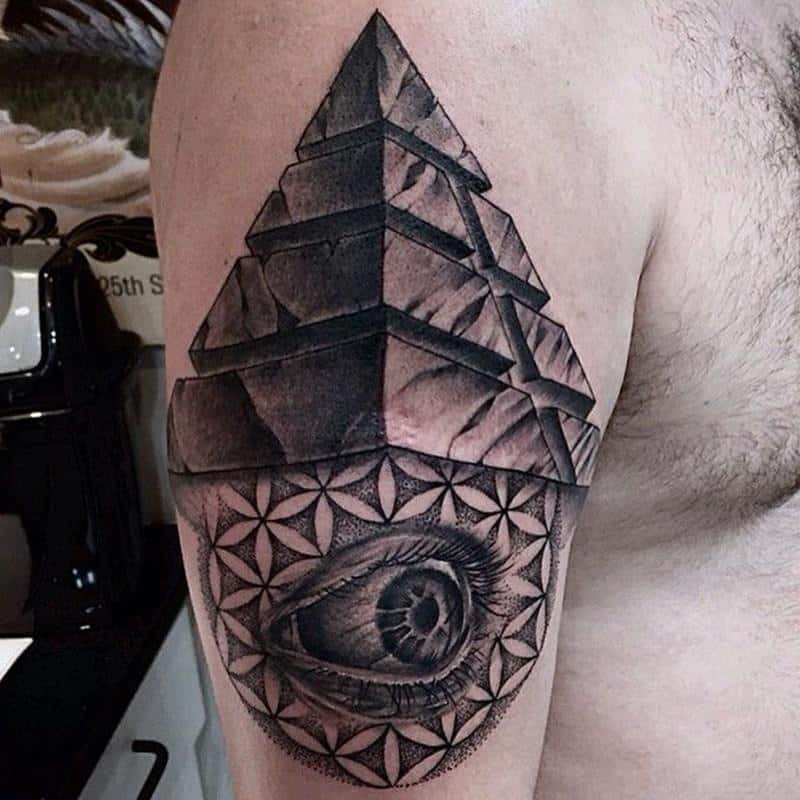 A cool design that has the eye in the middle of the pyramid. This is one of the more basic styles that we have seen so far. 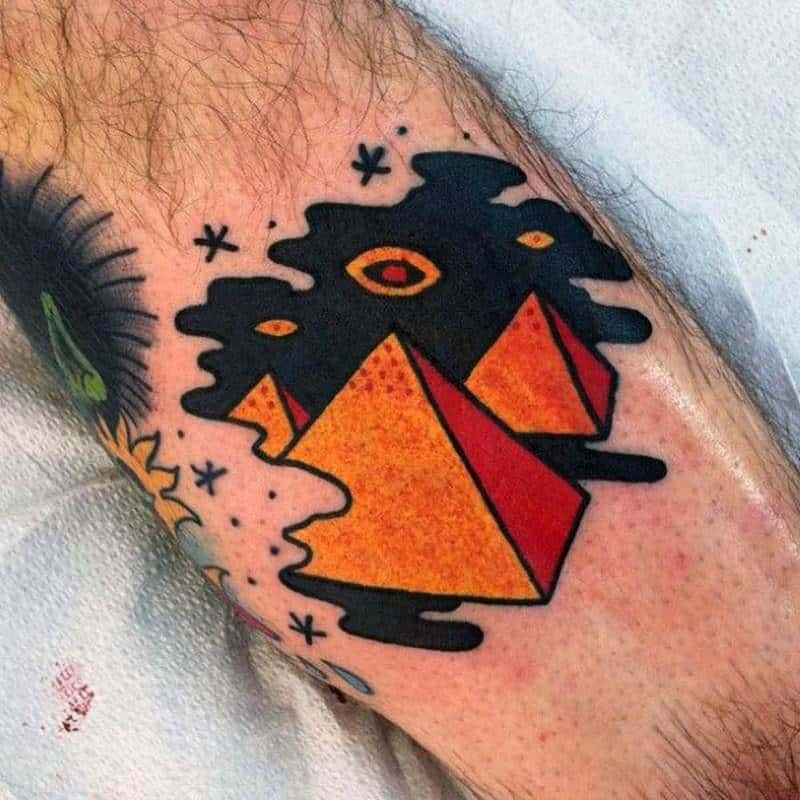 There is a lot going on with this tattoo and there is a ton of mystery as well. 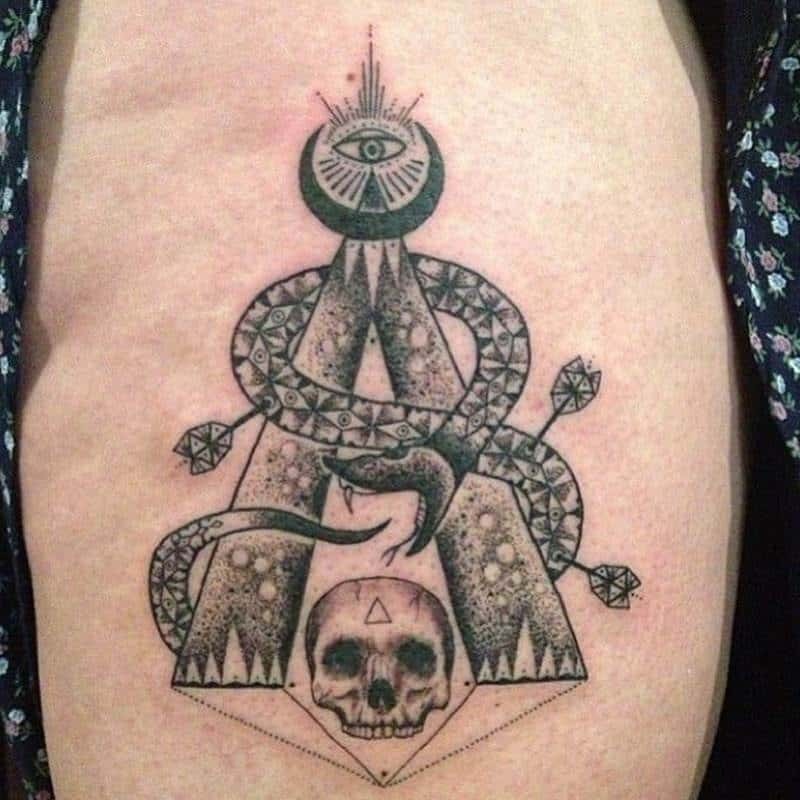 We have serpents, skulls, geometric elements and All-Seeing Eyes everywhere. 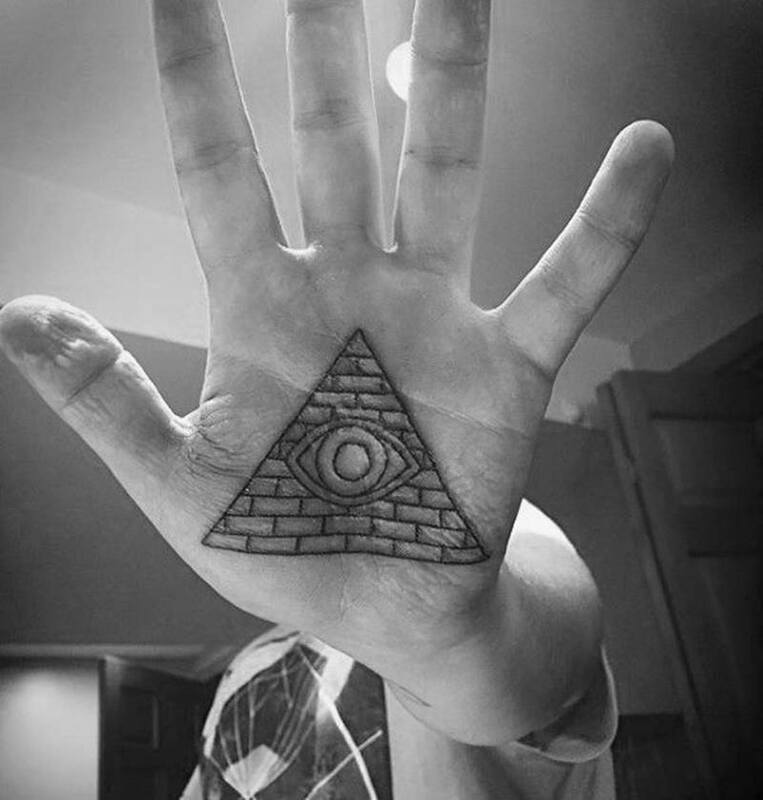 The hand is a great place for a pyramid tattoo because it fits perfectly! 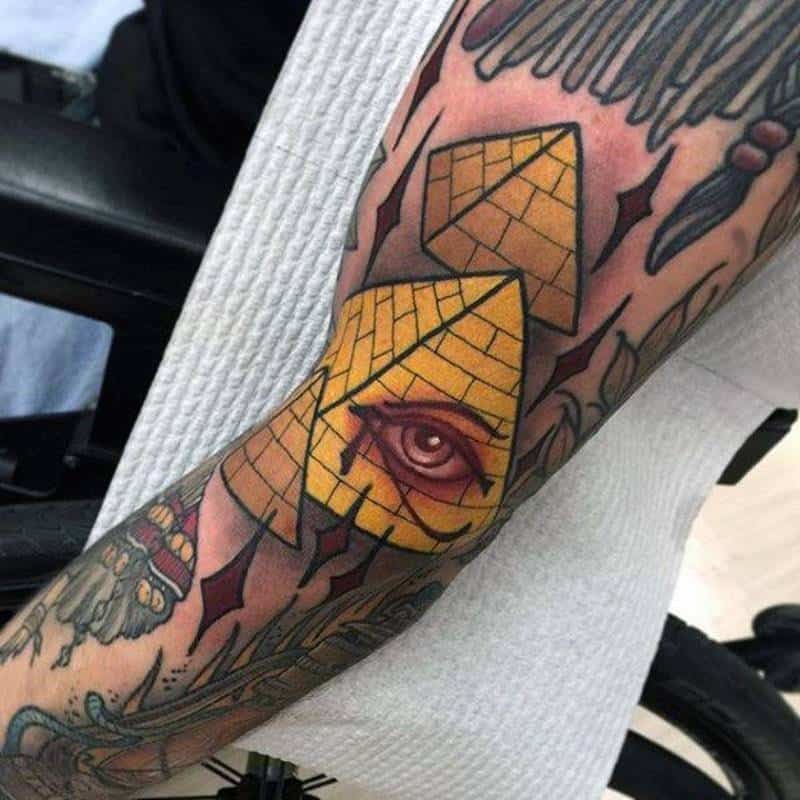 We just love the bright yellow here because it just makes the whole tattoo pop. 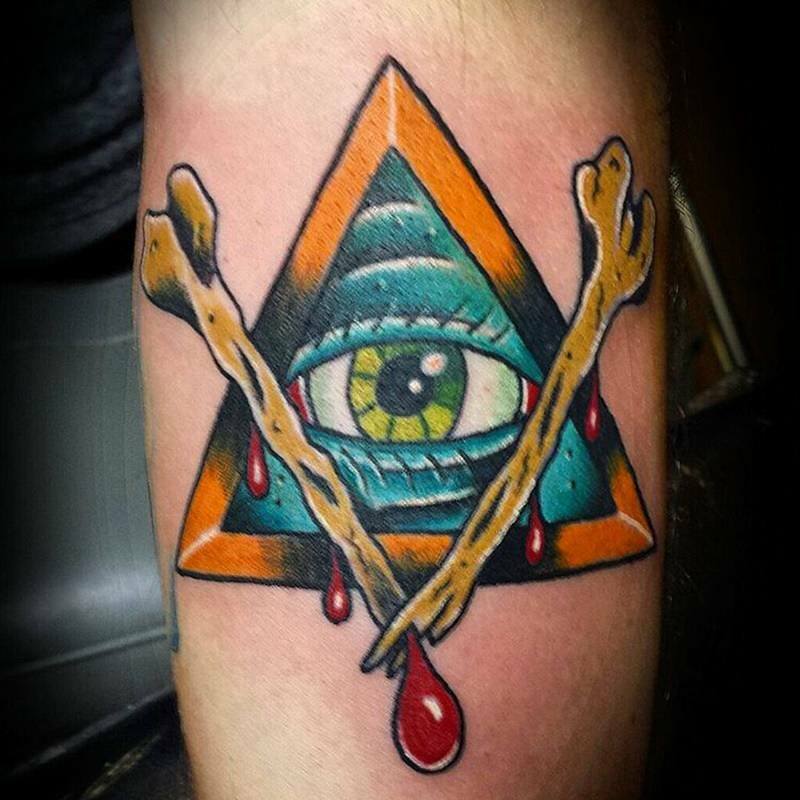 If you are looking for bold colors, then you can’t go wrong with a tattoo design like this one. We love the stunning shades, they are glorious. 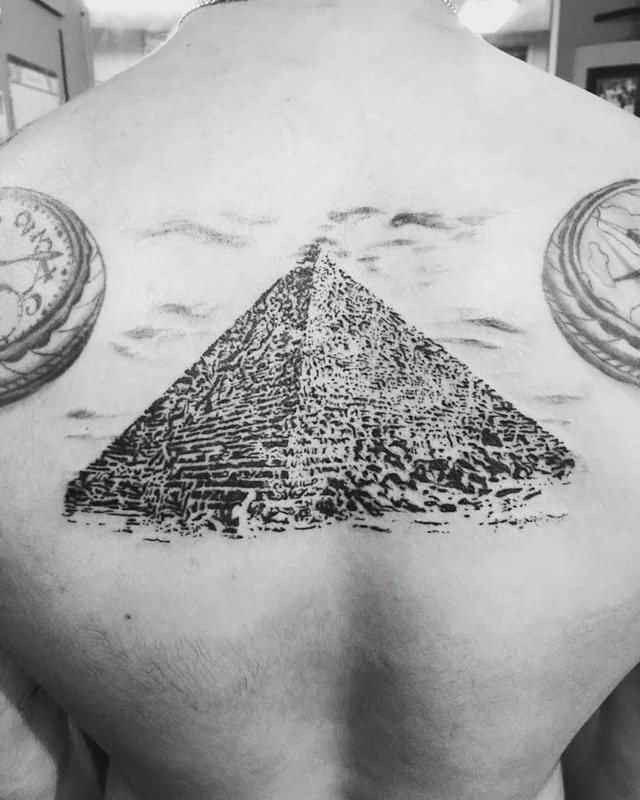 This pyramid just melts right into the clock design. We just love this style because it’s warm and inviting. 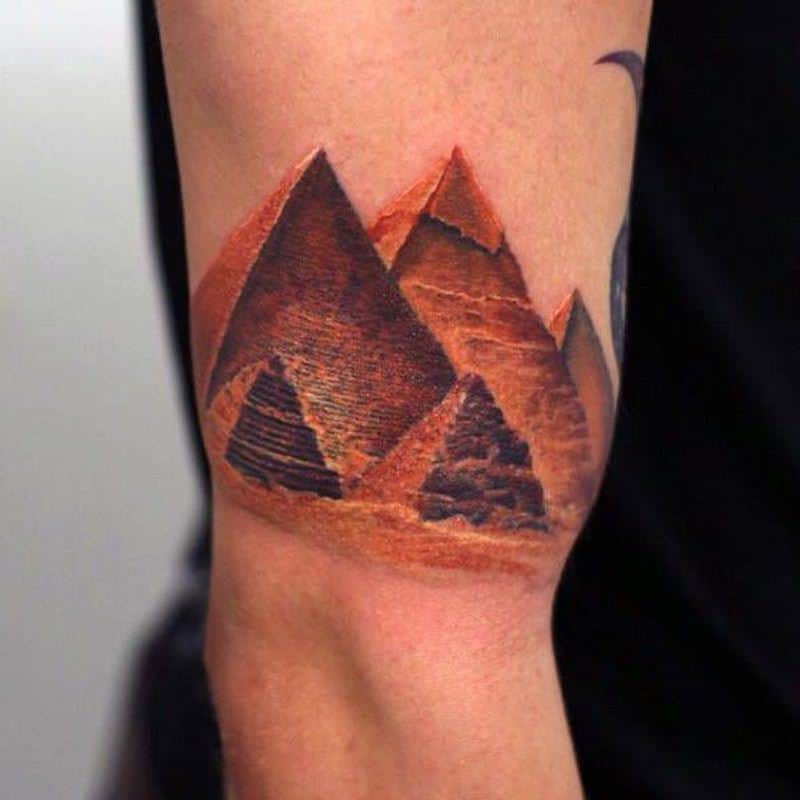 The stunning shade makes it look as if the sun is setting on top of the pyramids. 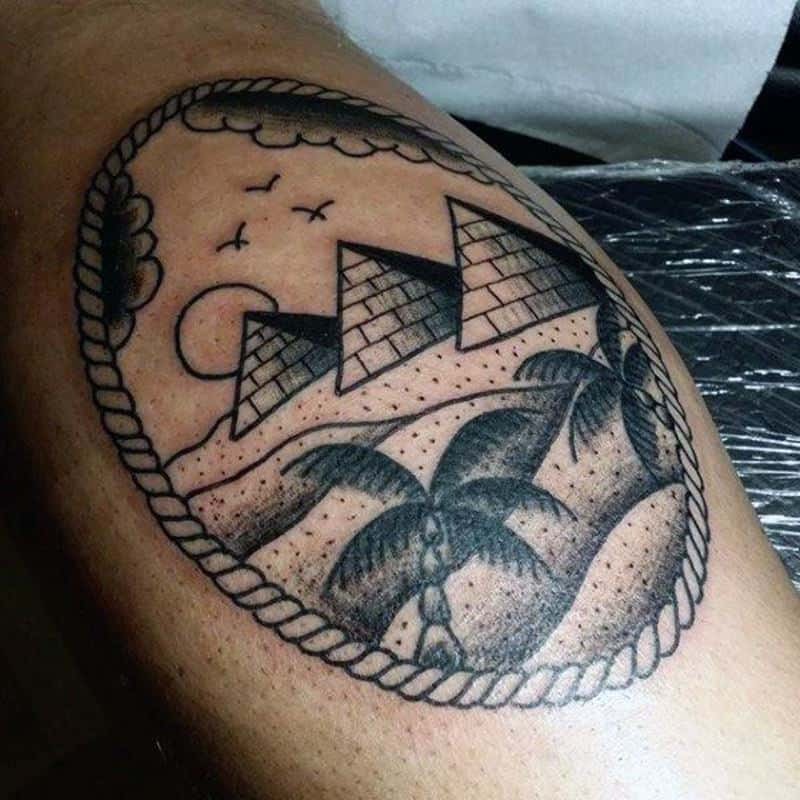 A cool design that makes it look like the pyramids are on vacation. Don’t get just any old pyramid design. Get something epic that comes right from the history books. 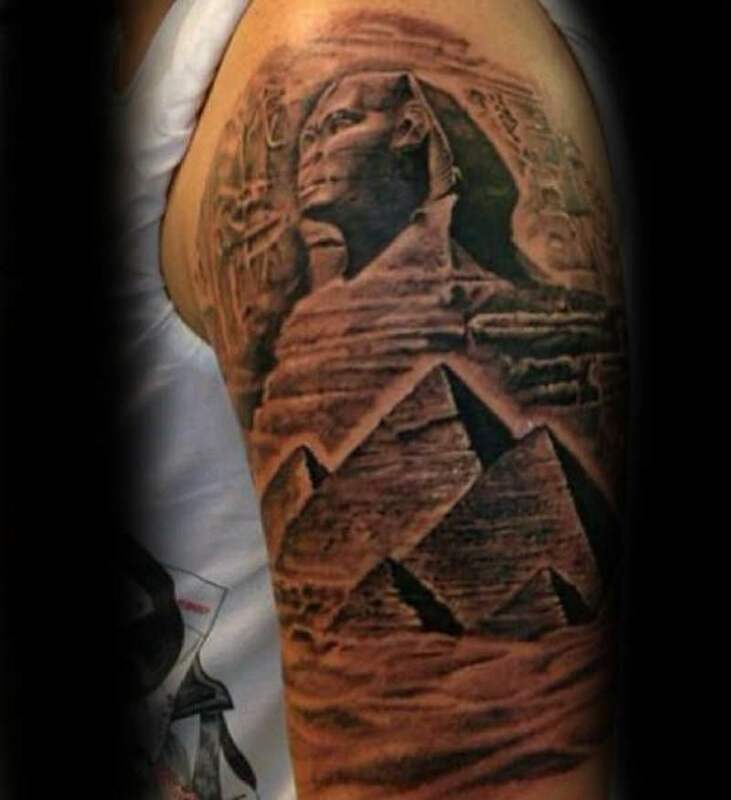 If you love Egyptian architecture, then you are sure to love this design. You don’t need a huge design to make an impression, try this little style on for size. 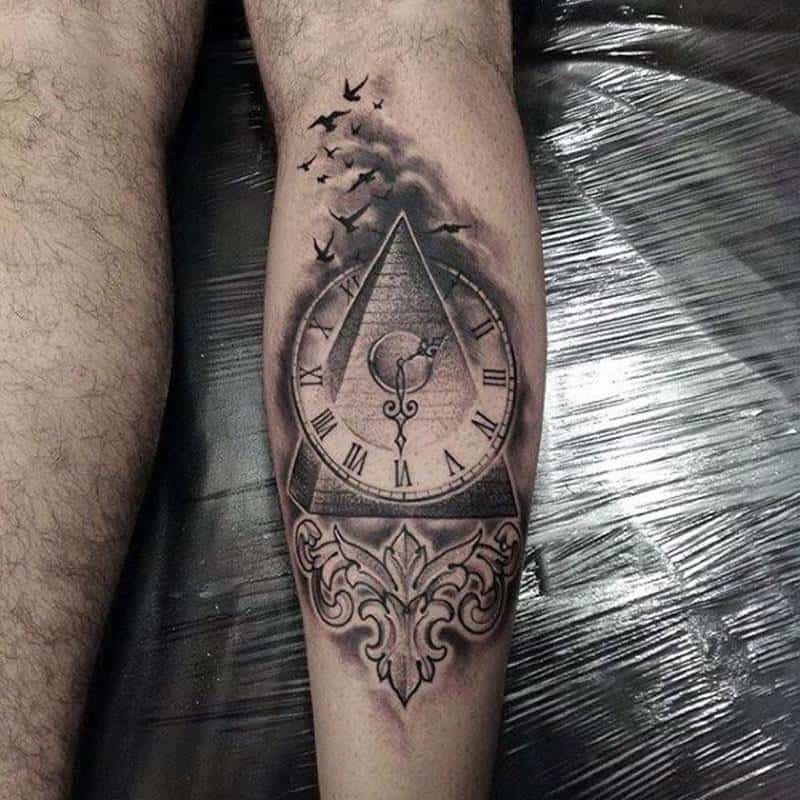 A great tattoo design that has mysterious elements to it. A great style that is sure to impress you regardless of where you go. We just love these bold colors. 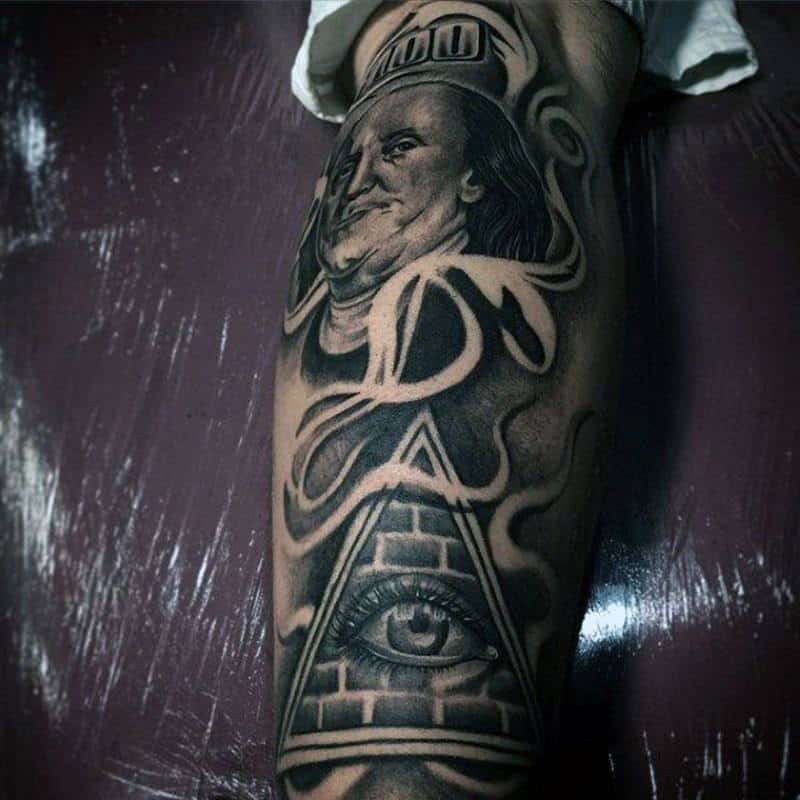 This dark sleeve is interesting and detailed. 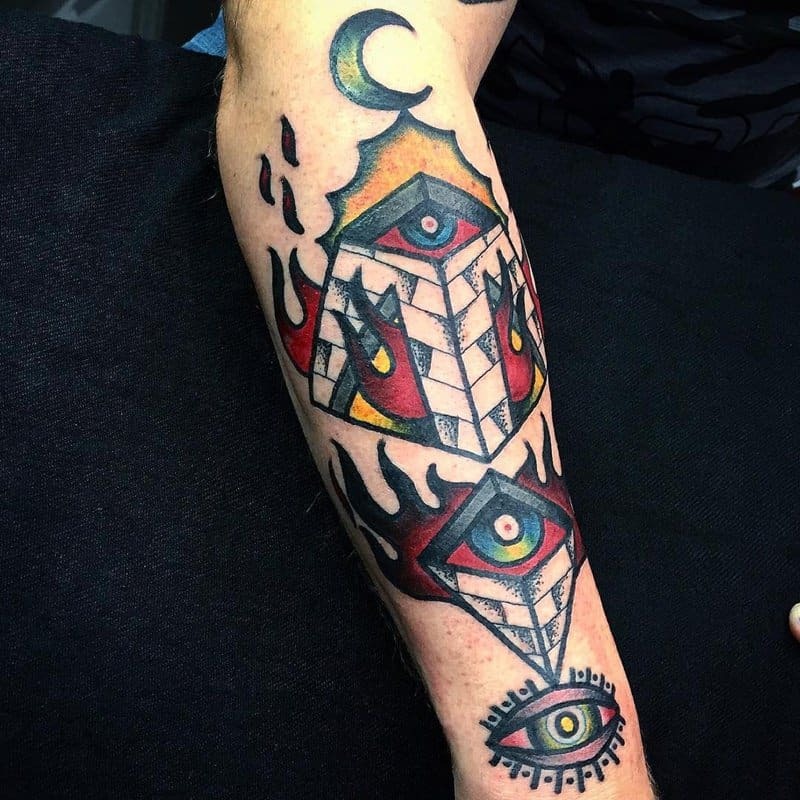 We love when sleeve designs mix together other elements. 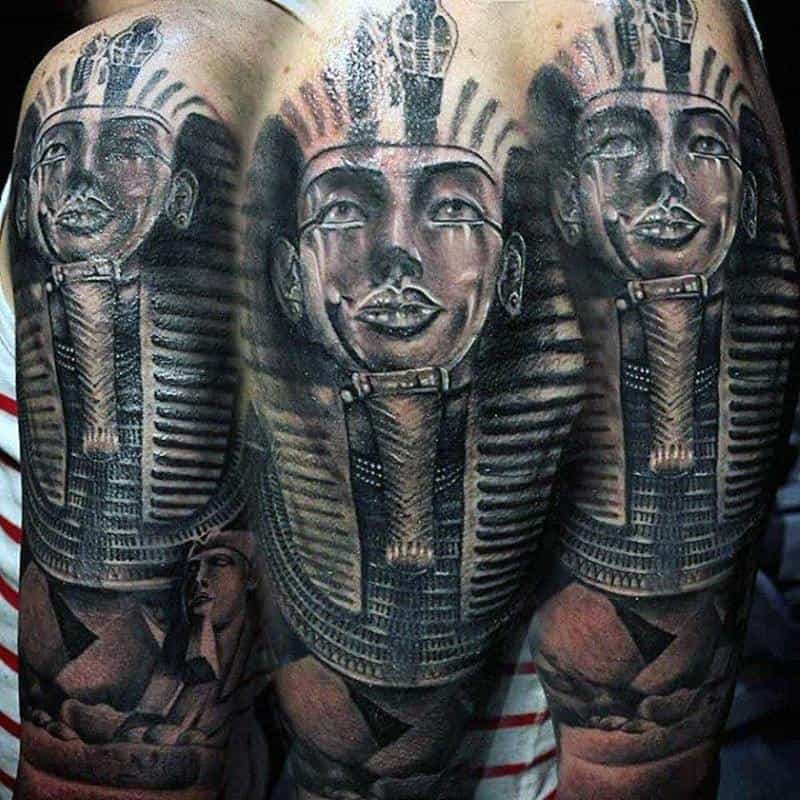 We get multiple styles here with this tattoo design. 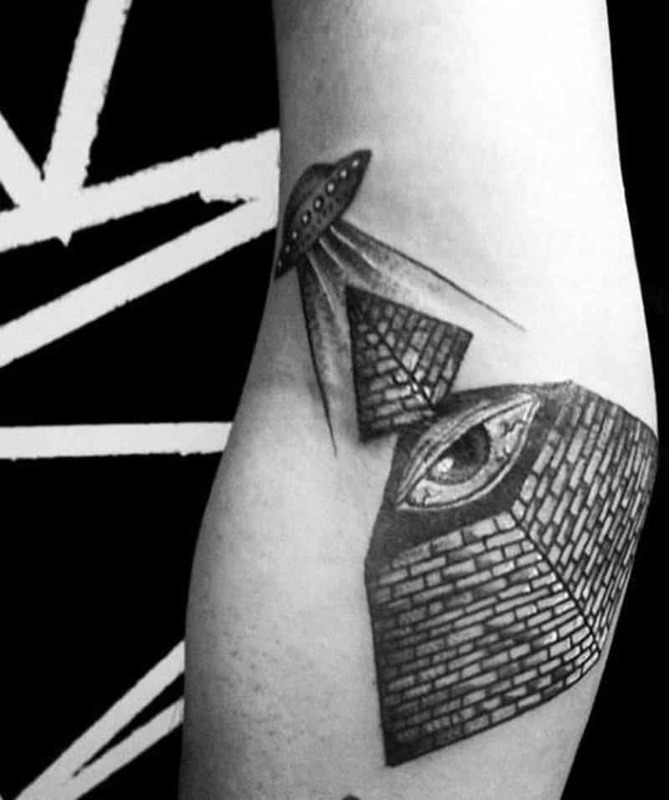 This gorgeous tattoo design has the elements of time within the pyramid. With love the ornamental elements that we see with this tattoo. 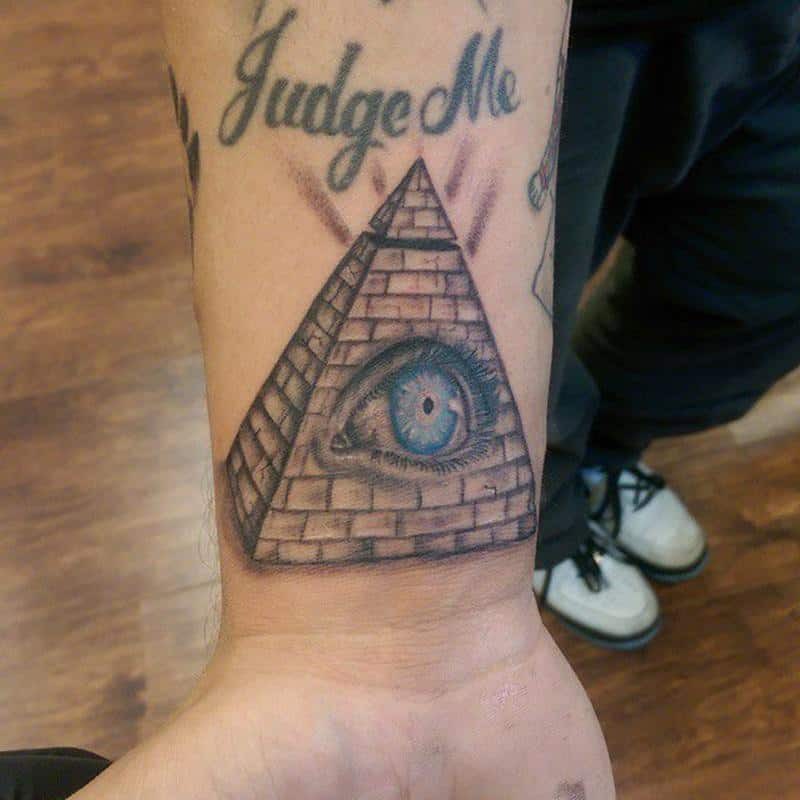 We see here that the top portion of the pyramid is the All-Seeing Eye. 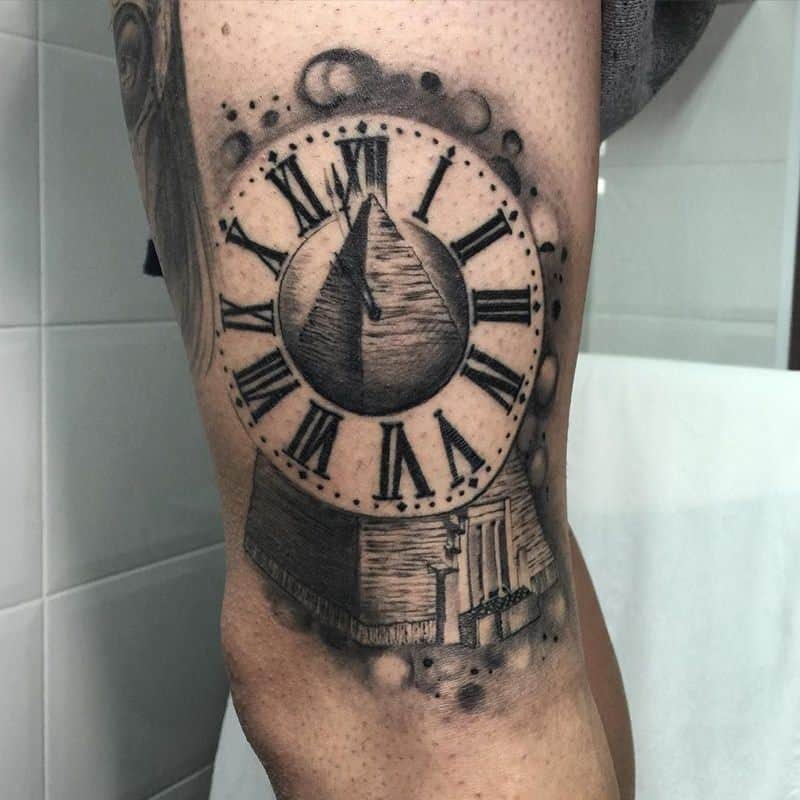 Try a tattoo like this one and you will have people talking about it all the time. This is a stunning design because of all the detail. It practically looks like a portrait, it has so much detail to it. It’s a large design that sits on the inside of the arm and it is sure to draw the eye wherever you go. 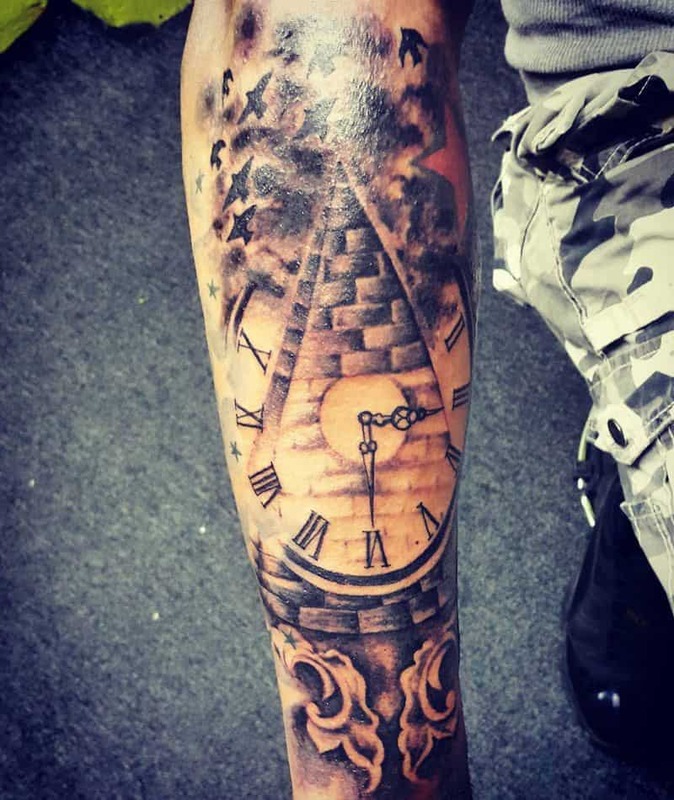 Another great example of a pyramid and clock theme together. 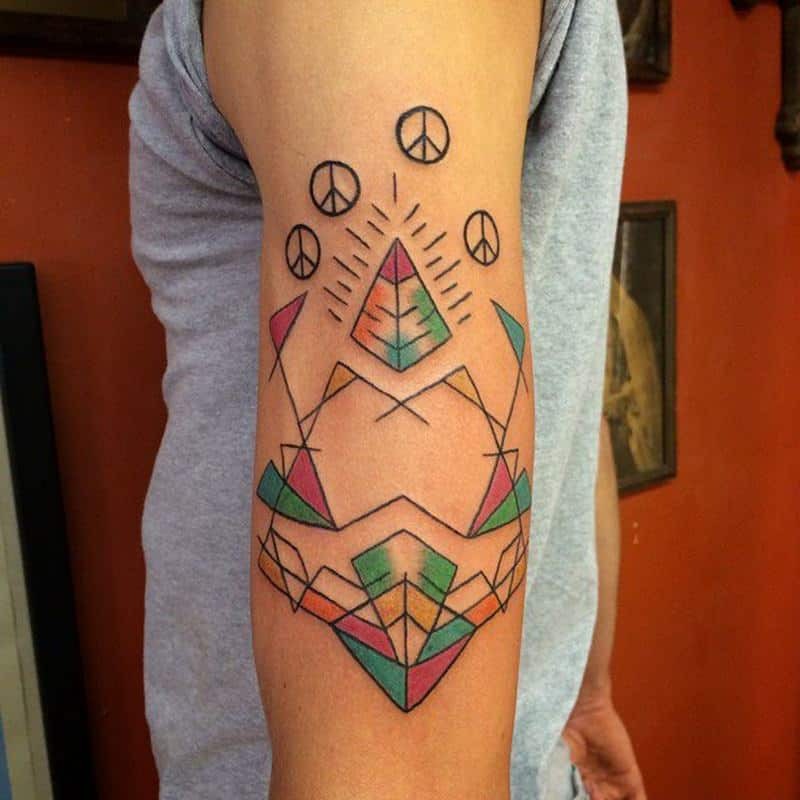 We have another great tattoo design that has bright colors and bold shapes. 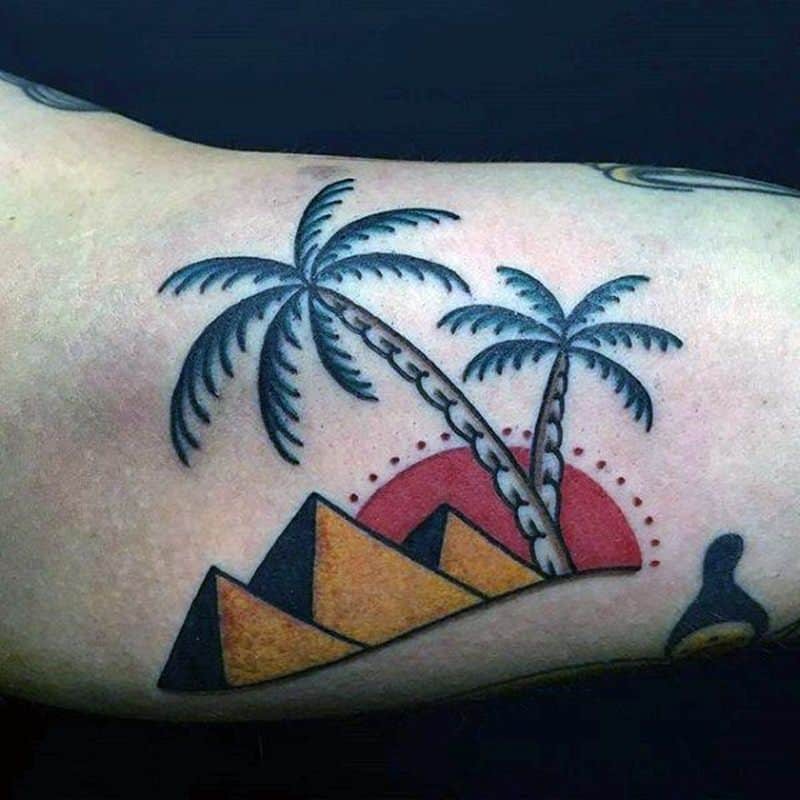 We see the palm trees once again with this tattoo design. 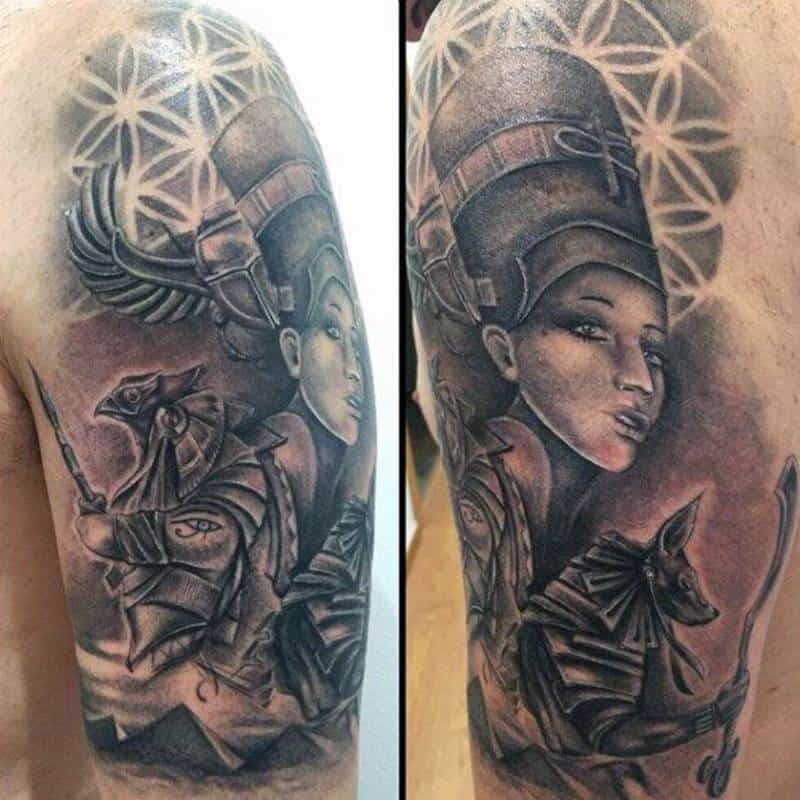 This sleeve design has a great Egyptian structure on it. 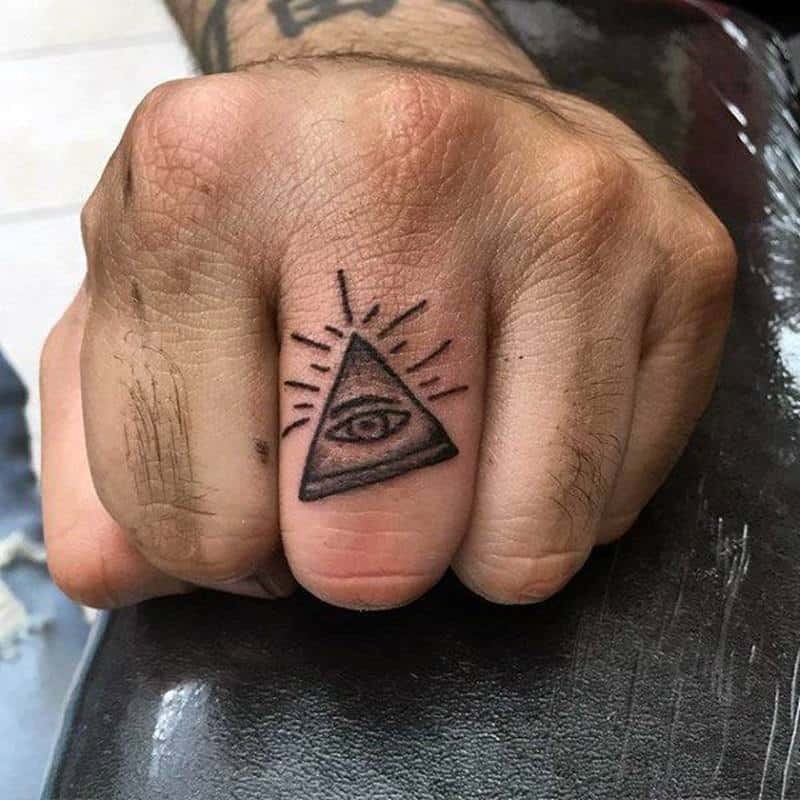 If you want something impressive, then this is the tattoo for you. 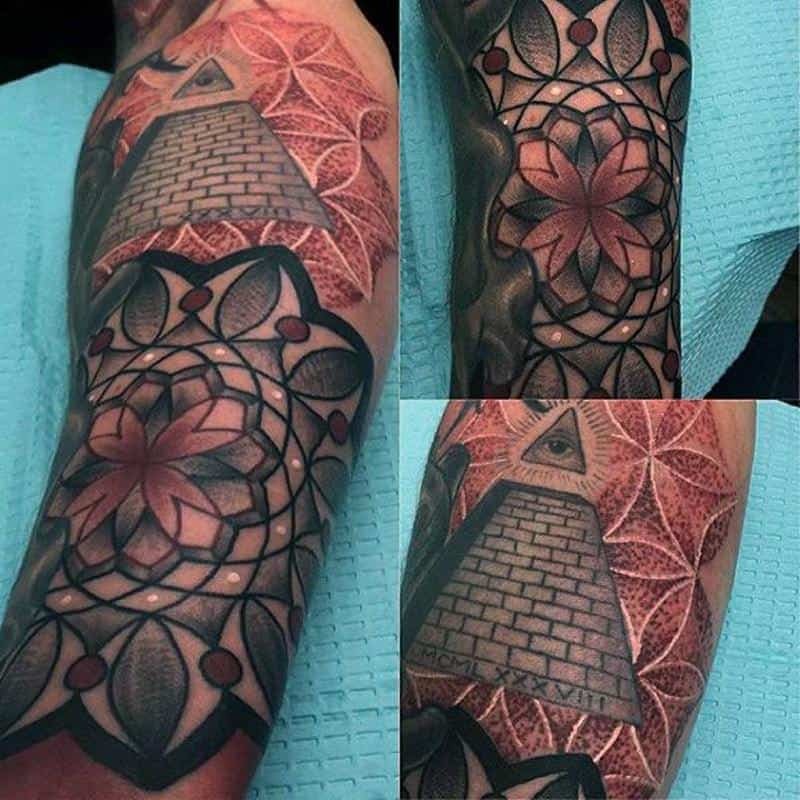 We love how amazing the red looks with these pyramid designs. 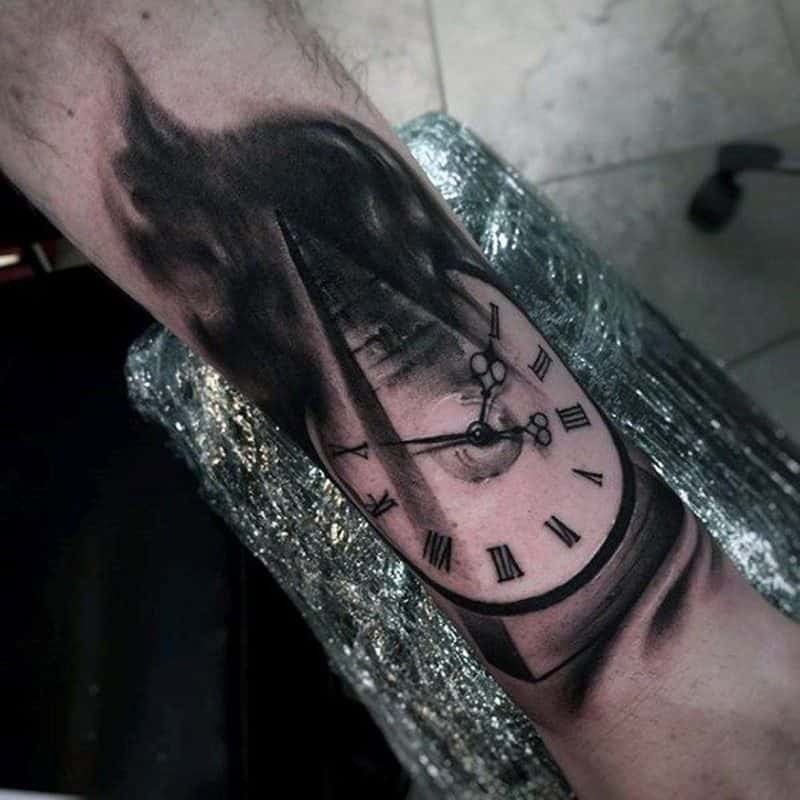 If you are looking for a cool tattoo design, then try red out. 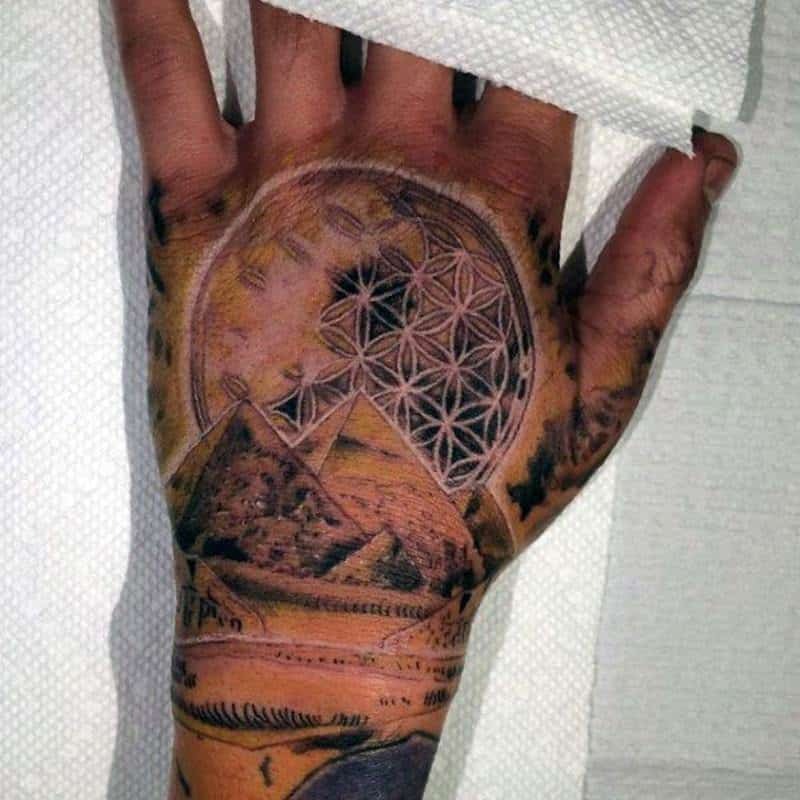 This is definitely a cool palm tattoo. 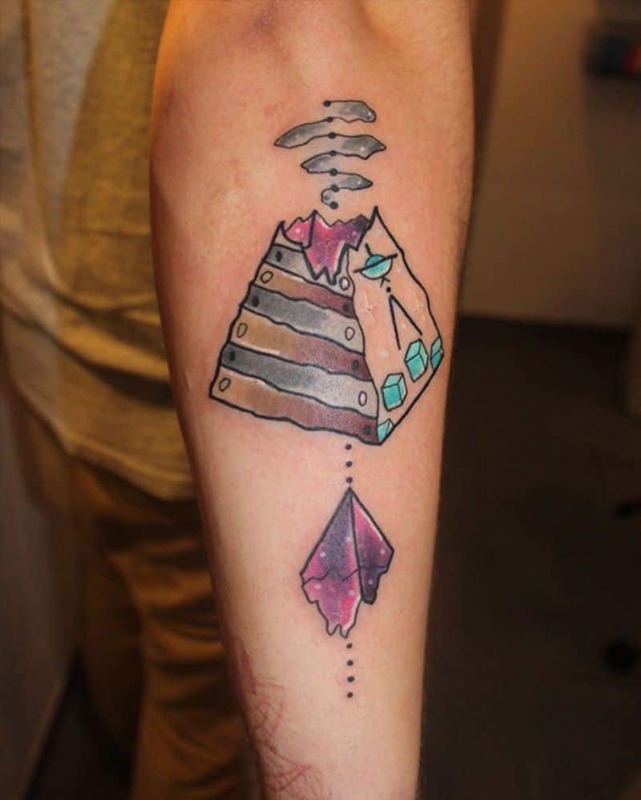 What more could you want from a tattoo? 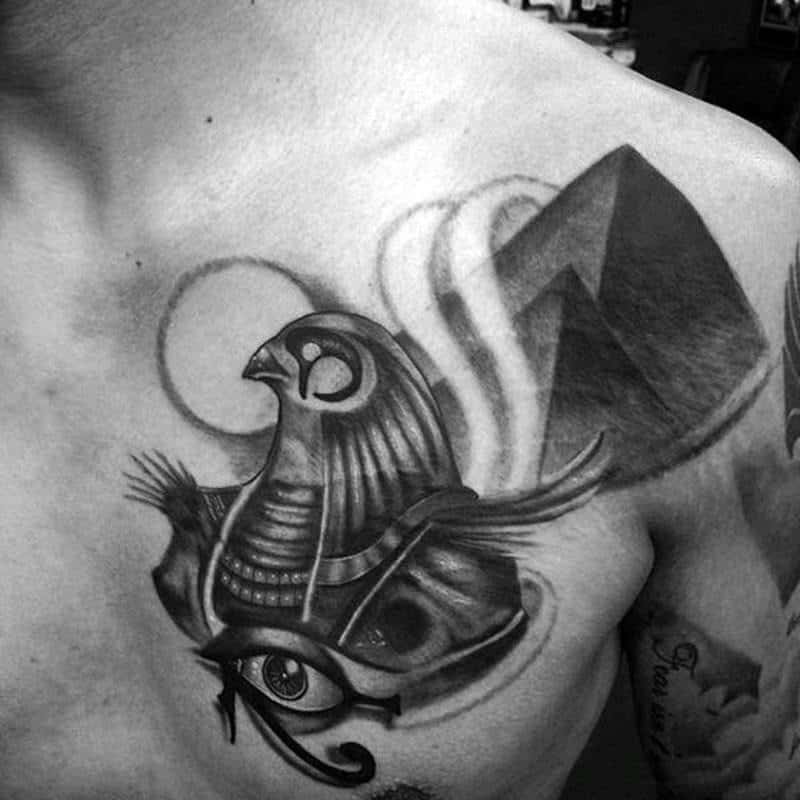 This is another large tattoo design that has the pyramid inside the owl. If you’re looking for something a little different, then you can’t go wrong with this style. 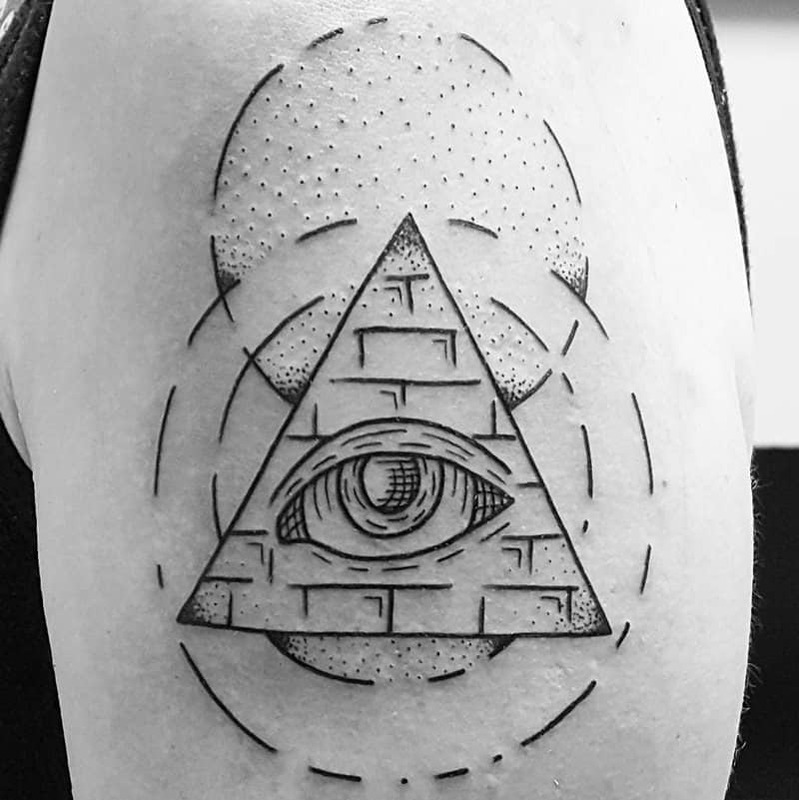 This style is a little different because although it is in the shape of a pyramid, it’s not a traditional pyramid image. There is a lot going on with this design and there is likely a story behind it all. If you are thinking that you want something more simple, then this might be what you’re looking for. 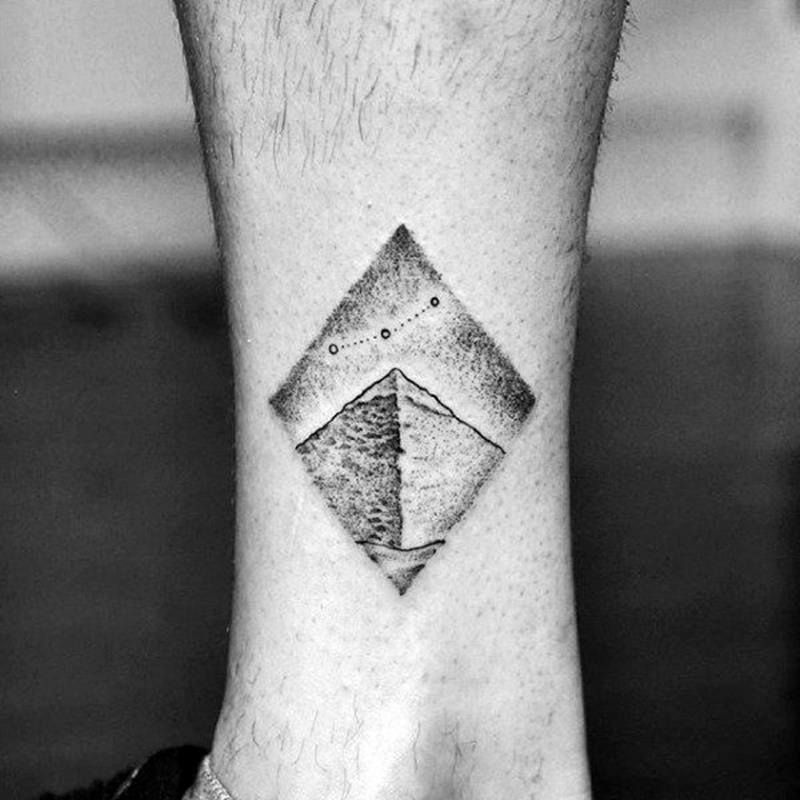 This is the perfect tattoo for this spot and it’s all enclosed in a circle. 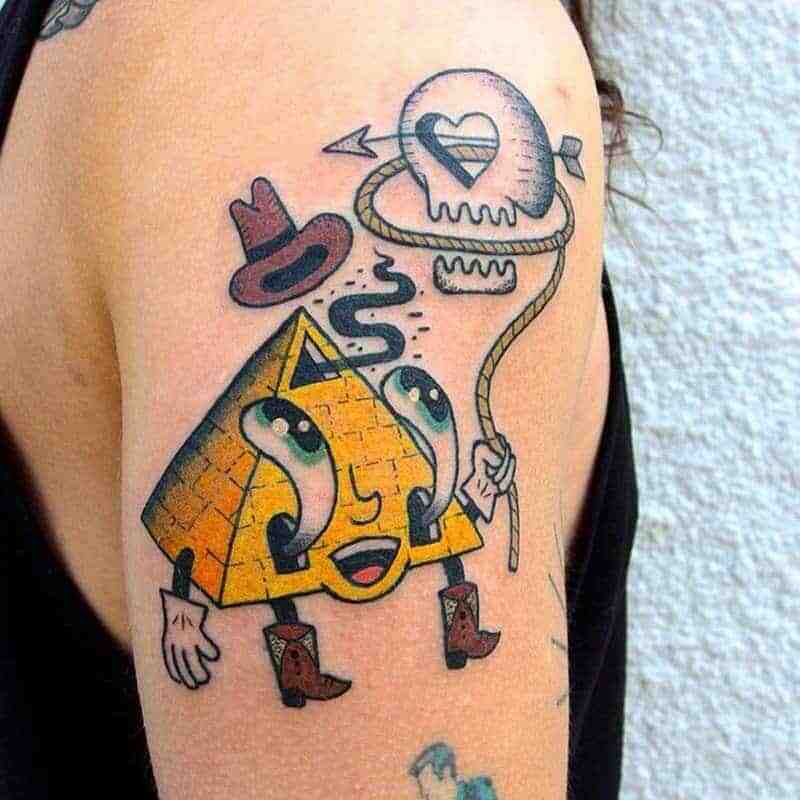 This is another cartoon image tattoo that is one of a kind. 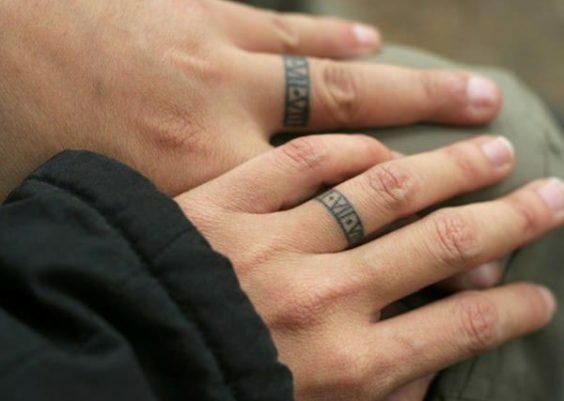 Maybe you don’t want something serious, you would much rather have a fun-loving type of tattoo. 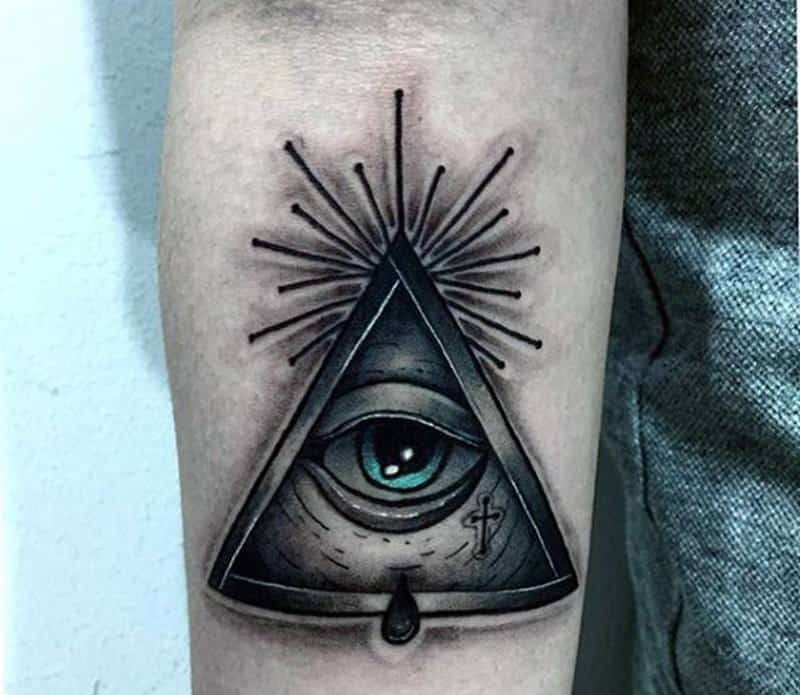 There’s something about this eye that makes us think that it knows a lot more than we would suspect. 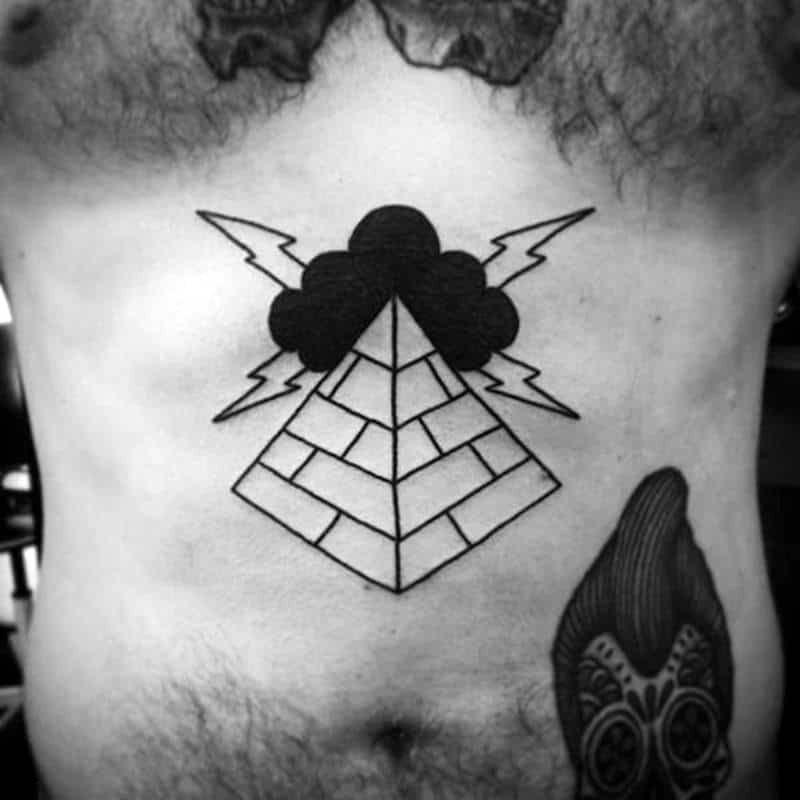 There is a storm brewing over this pyramid and we have to wonder what the story is behind it. 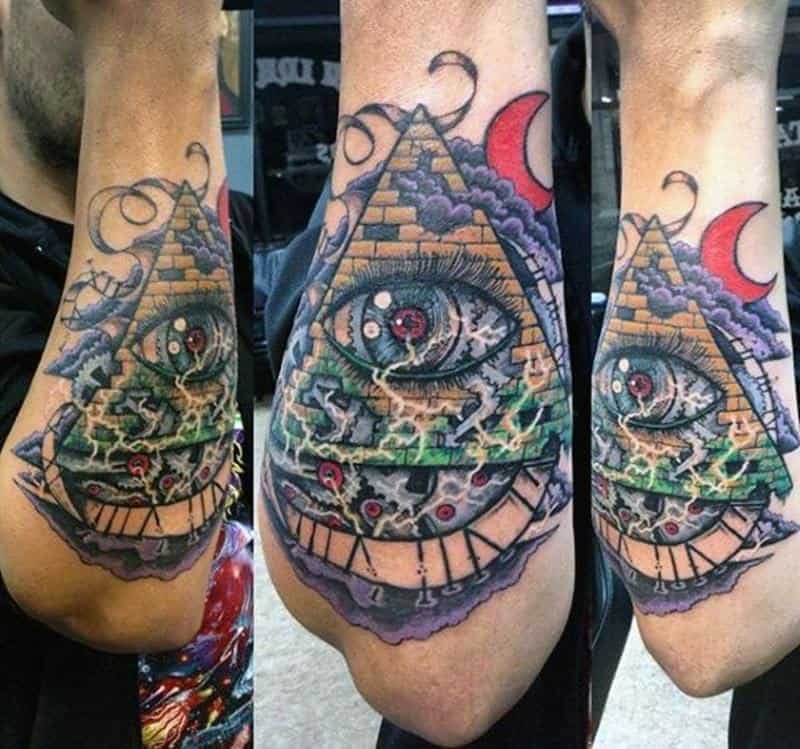 This cool image once again combines the clock and the pyramid together. 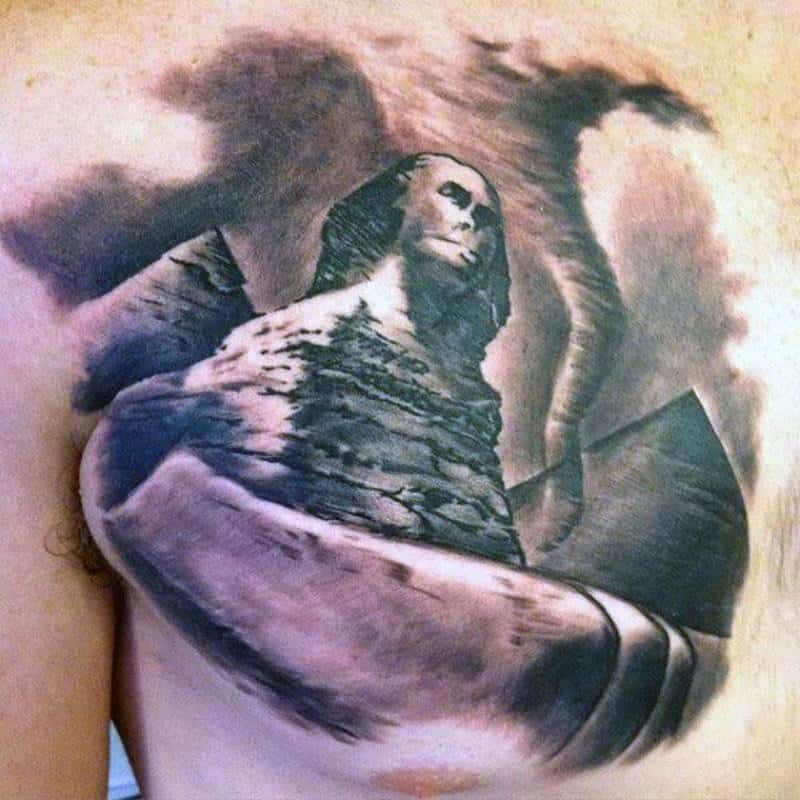 There is a lot of mystery and intrigue involved in a tattoo like this one. This is a very basic design but it has a strong message to it. It’s cool how a bunch of lines can create something so interesting to look at. 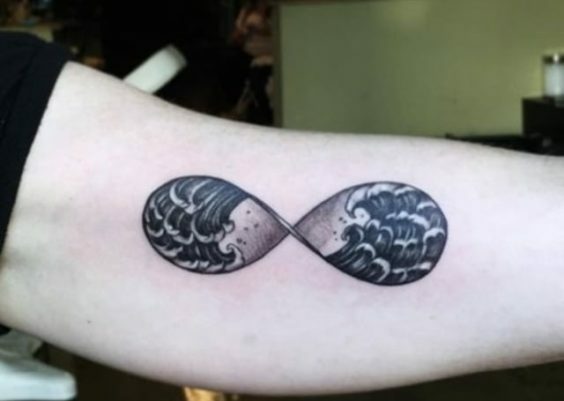 This is one of those tattoo designs that you want to try to figure out. 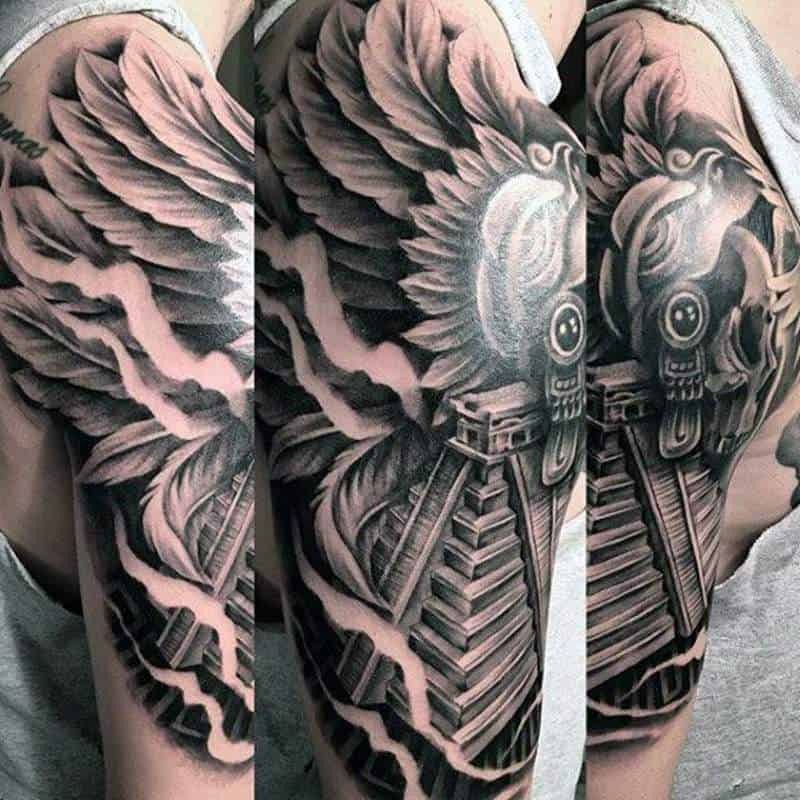 This is a huge tattoo on the shoulder but it’s a gorgeous one. If you are looking for a large design, then this may be exactly what you are looking for. 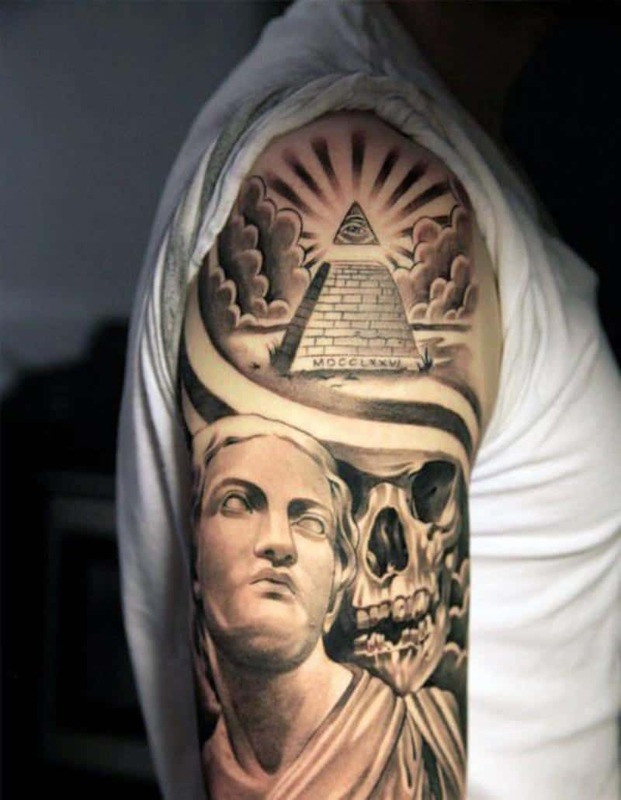 Another great tattoo image that you are sure to love. We have another style here with dark and disturbing clouds overhead. 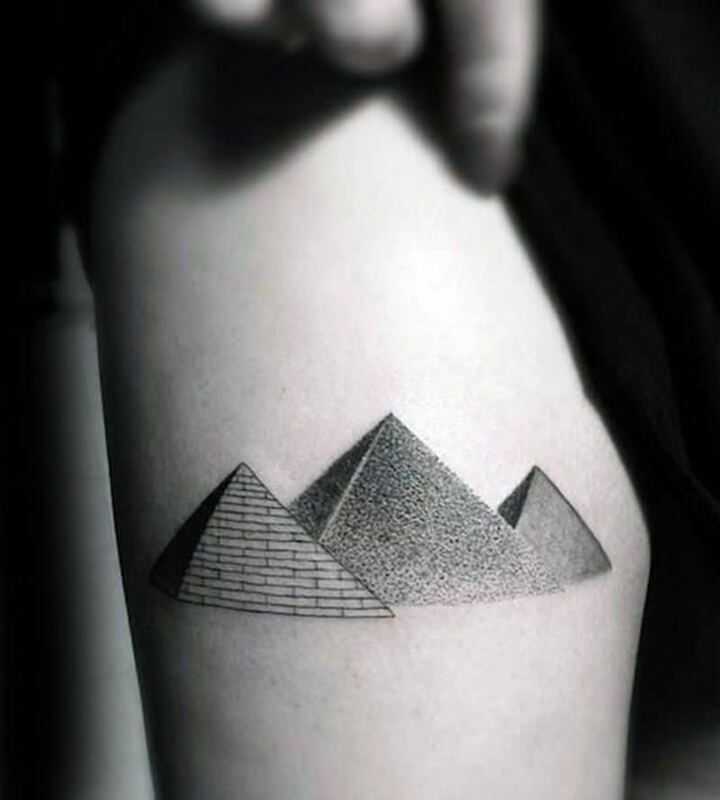 What we love about this tattoo design is that all the pyramids are different. There seem to be a lot of connections to aliens and pyramids. They make for cool and interesting designs. We love images like this because they tell their own story. 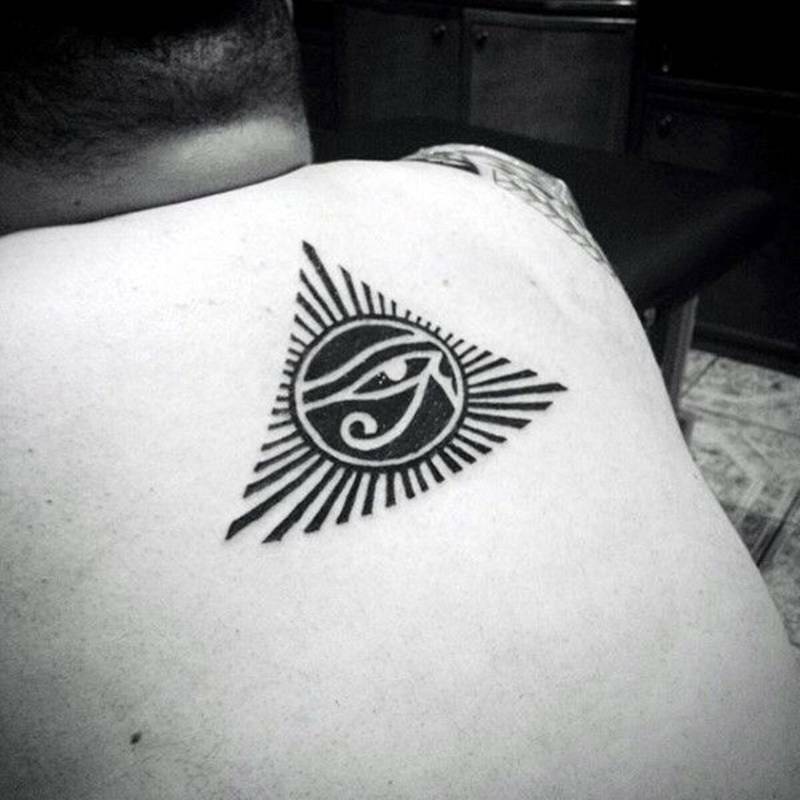 When you choose a tattoo design, try to get something that speaks to you in a personal way. 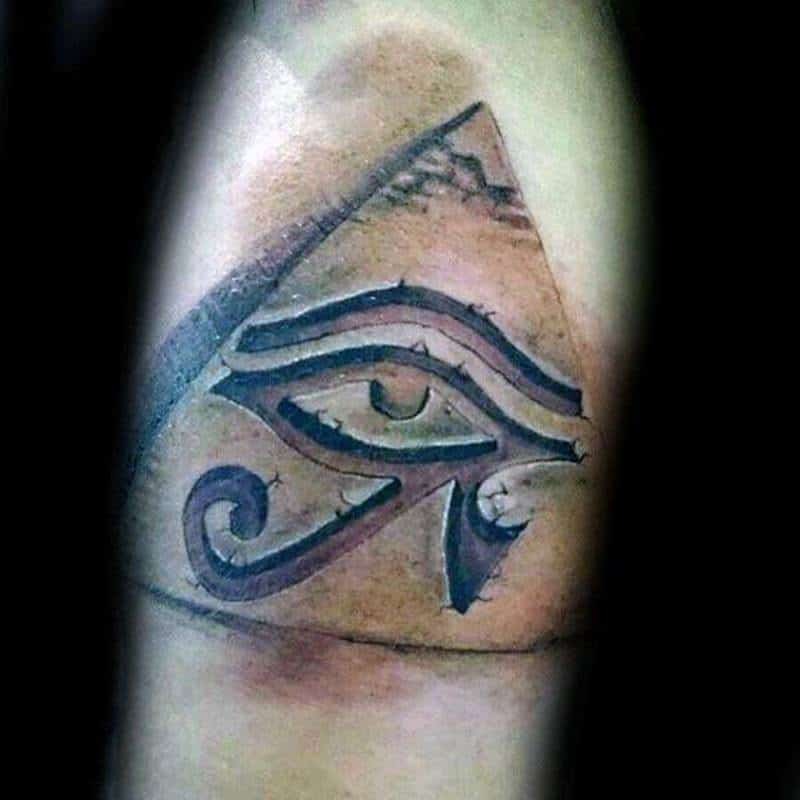 The All-Seeing Eye offers protection over the Gods of Egypt. This is a cool design that is also large. It covers the entire back. 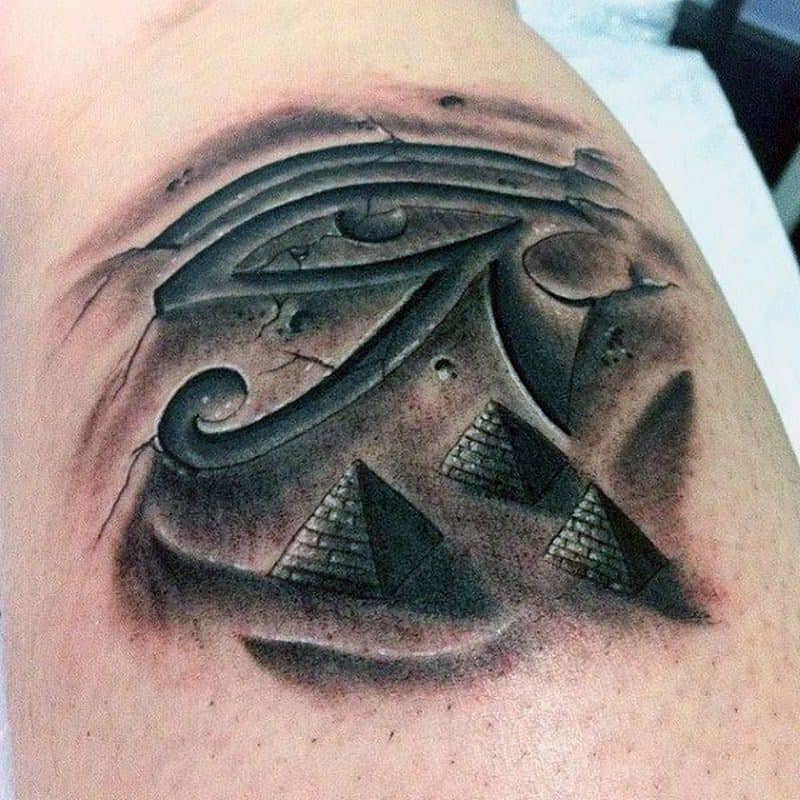 A cool tattoo design that has some elements that have nothing to do with the pyramid. 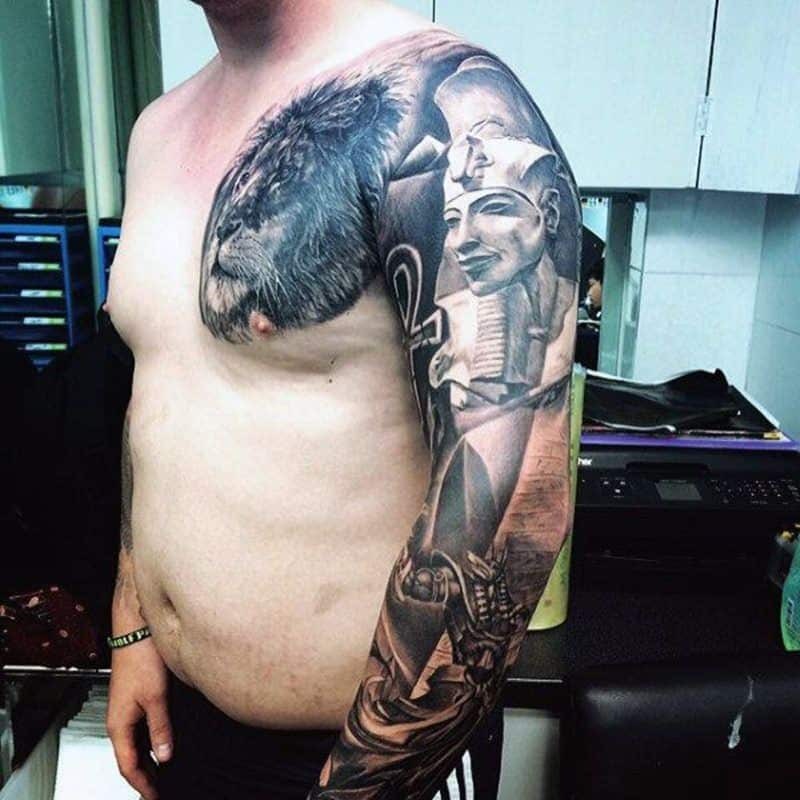 The lion is a nice touch as well. 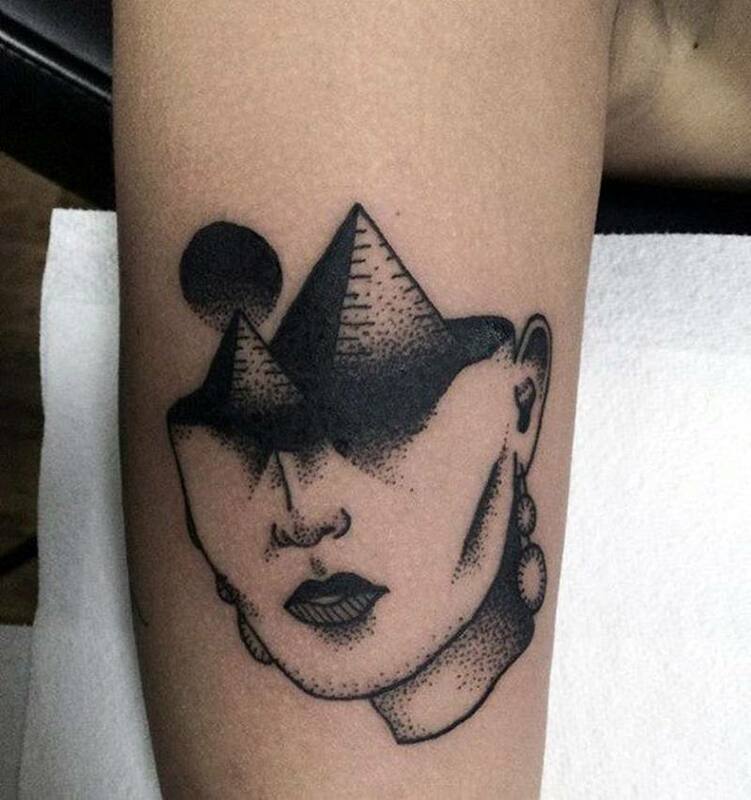 A gorgeous tattoo that has pyramids coming out of a head. It’s sure to be a conversation piece wherever you go. 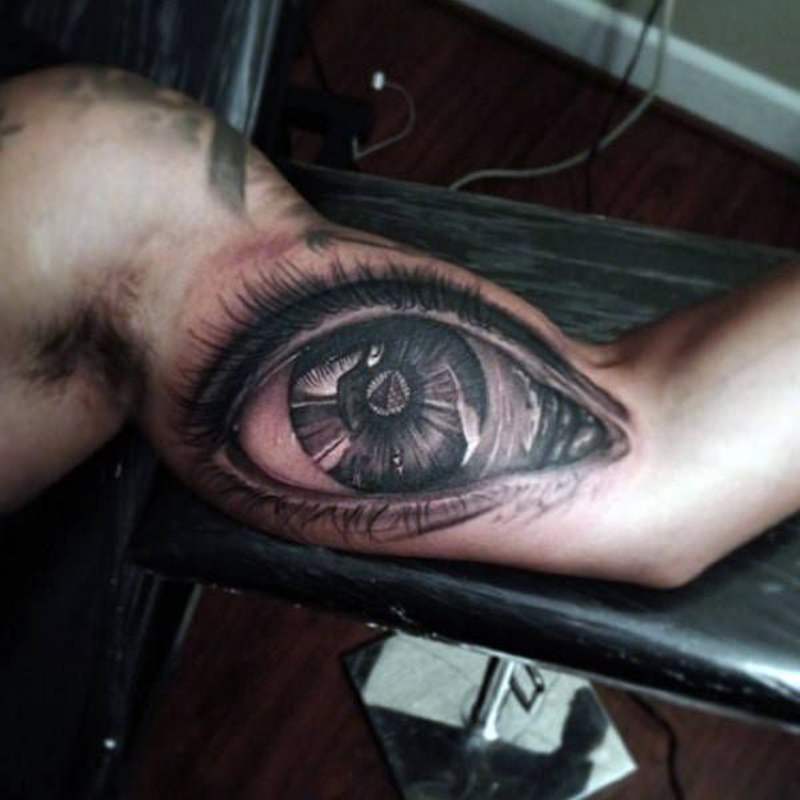 This tattoo design is so detailed that it seems like a real eye. 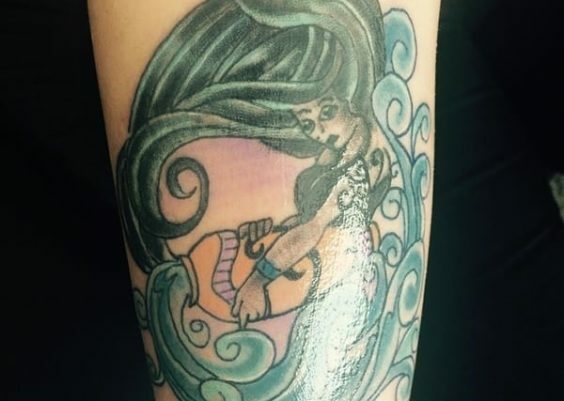 You are sure to get a ton of compliments with a tattoo like this one. 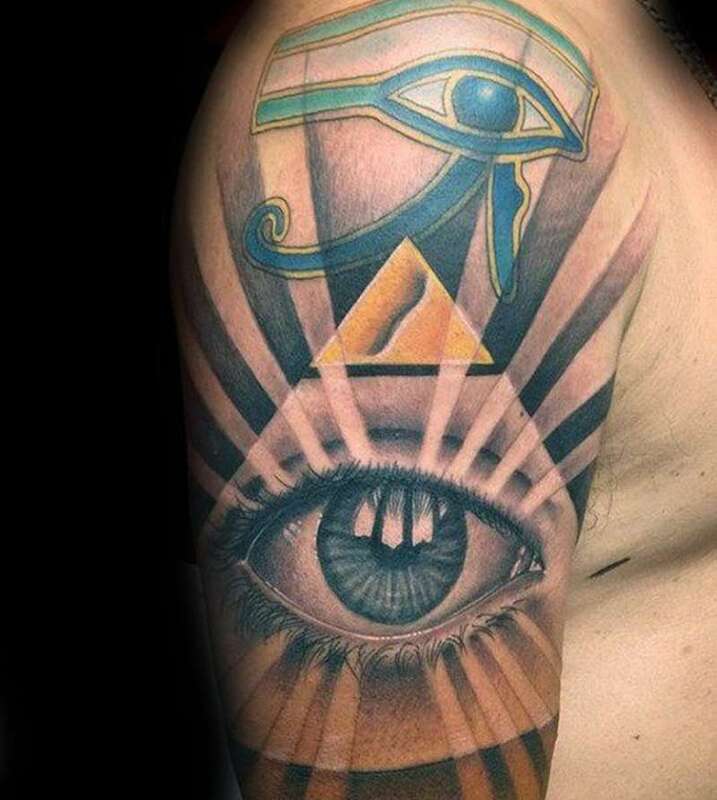 Another awesome tattoo that has both the All-Seeing Eye and a pyramid. 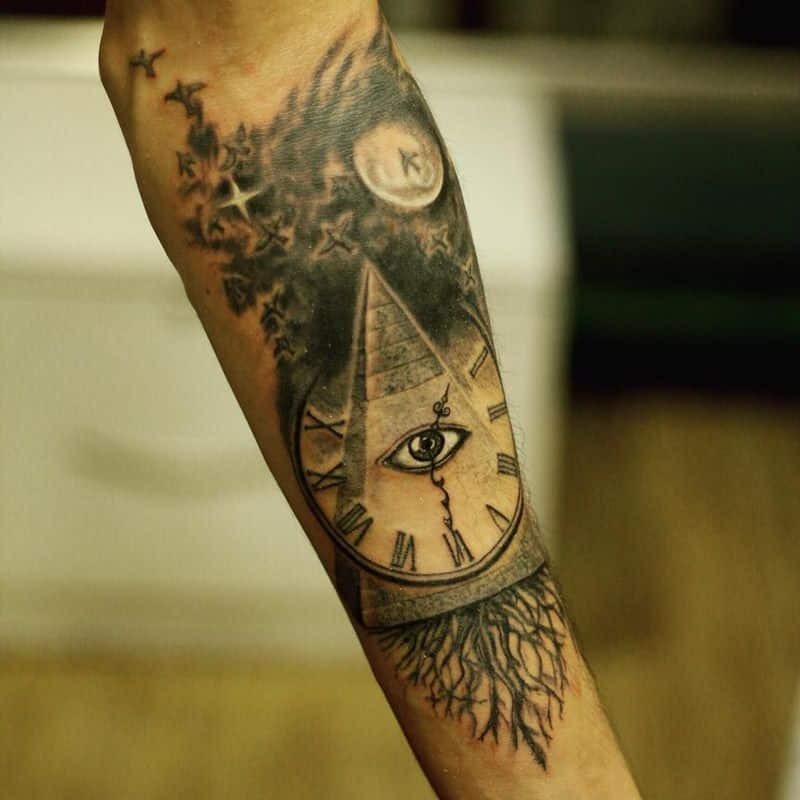 The great thing about sleeve tattoos is that you can fit a lot of different elements to the tattoo. 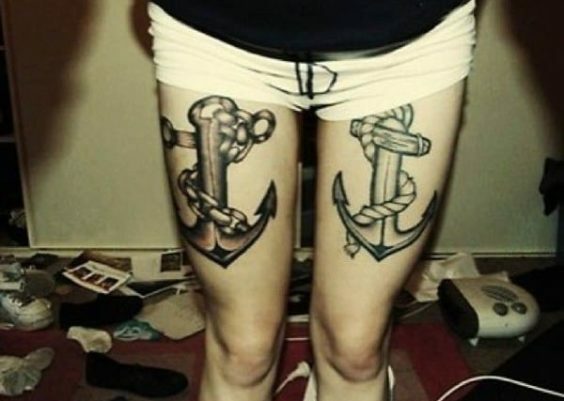 Great tattoos come in all shapes and sizes. You can see that with this tattoo design. 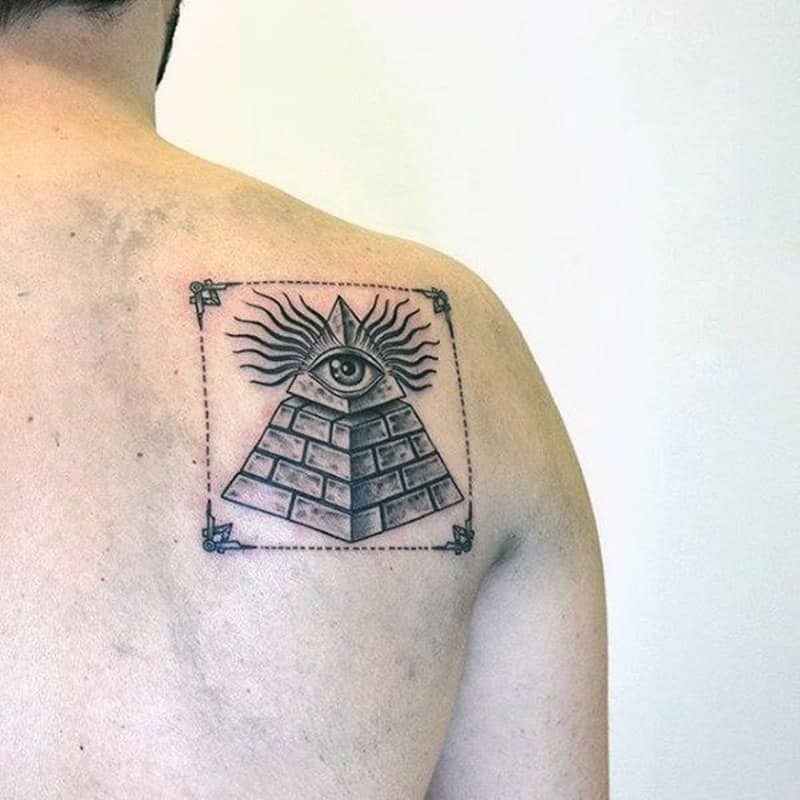 This tattoo implies that there are more things going on inside the pyramid than we were led to believe. 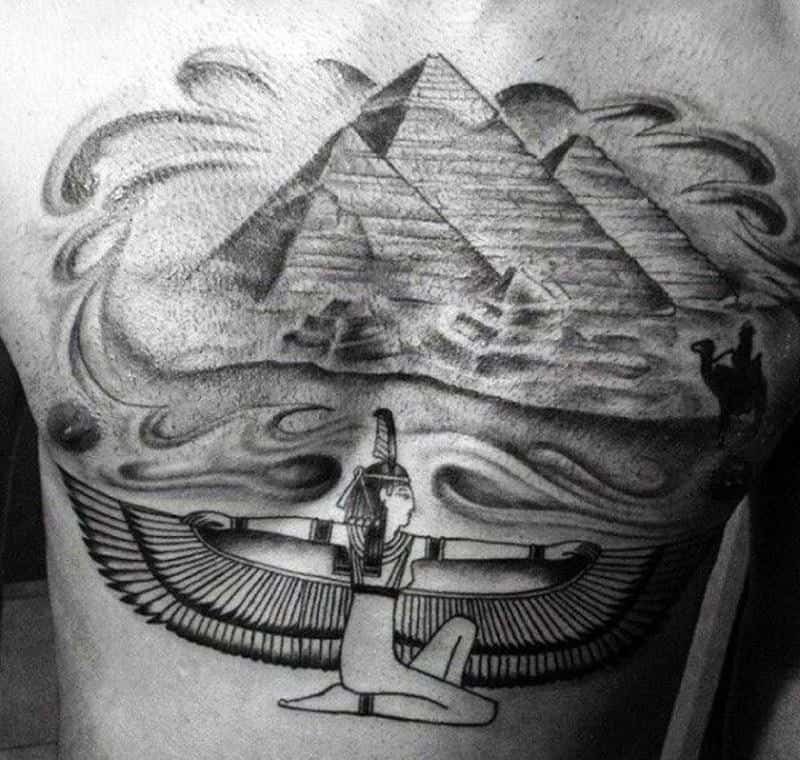 There are a ton of conspiracy theories on why the pyramids were built and you can use your design to tell your own story. 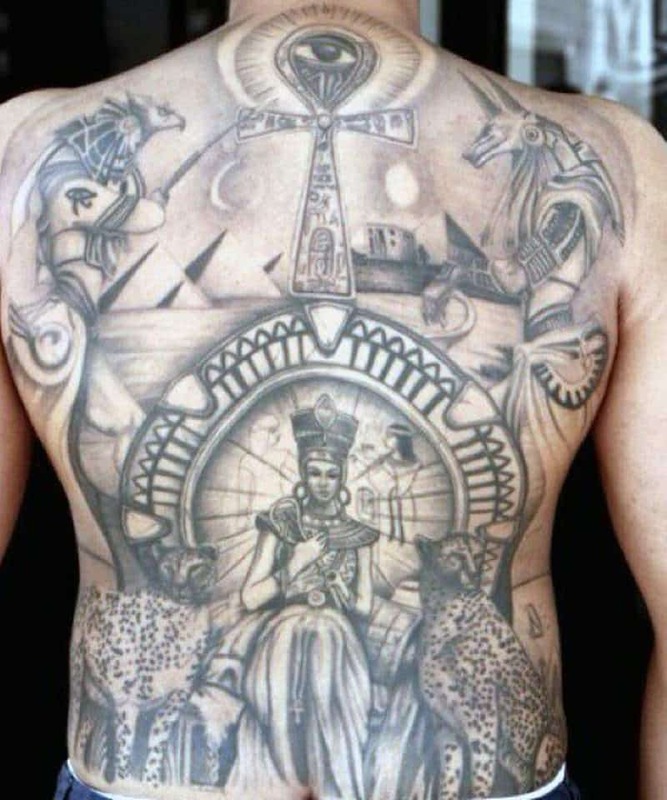 This awesome tattoo has all the important Egyptian figures from the medieval times. We love how huge the images are and the darkness conveys the depth of the characters. This pyramid design is in the middle of a square. It’s the kind of style that is structured and organized. 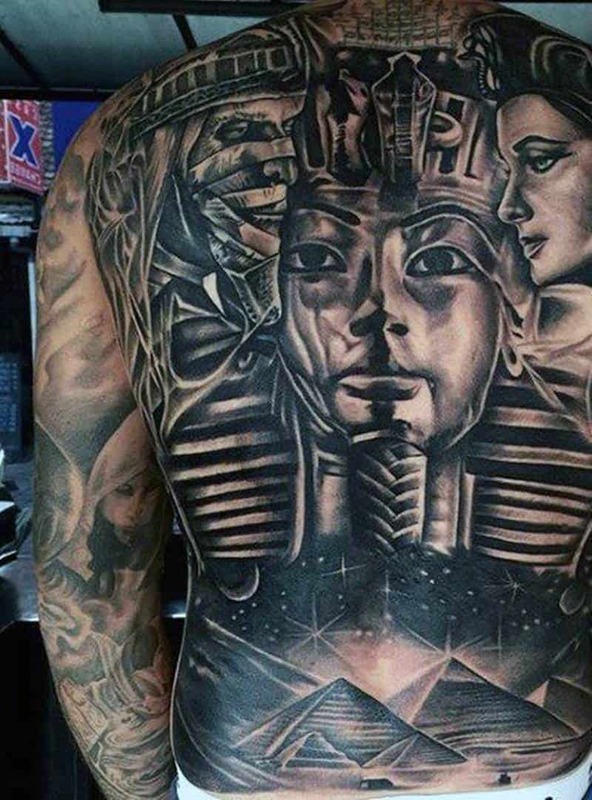 This person is clearly passionate about the images because the whole Egyptian theme covers his entire back. 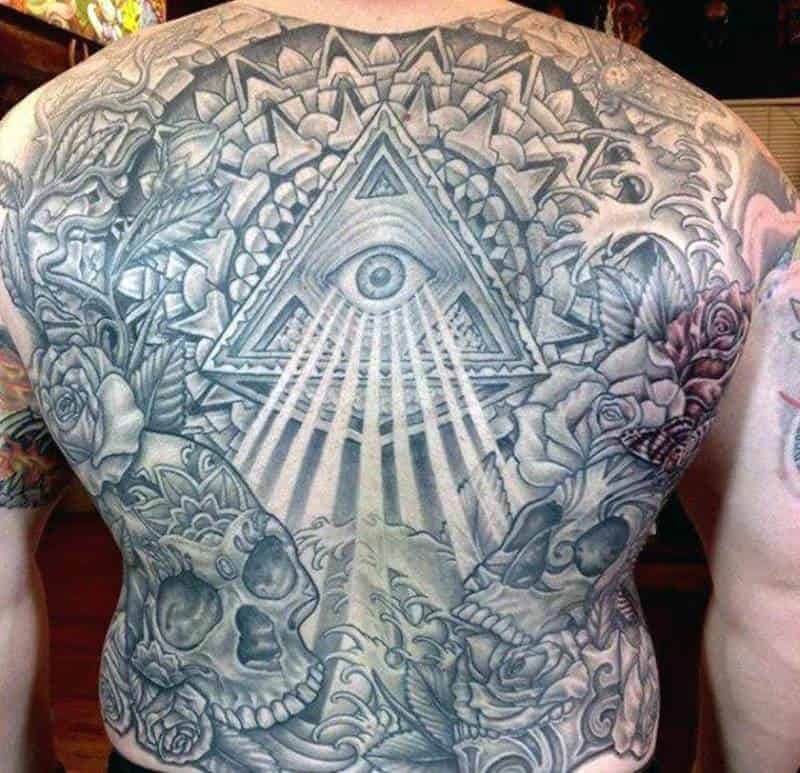 There are so many cool elements going on in the tattoo that you want to stare at it for hours. 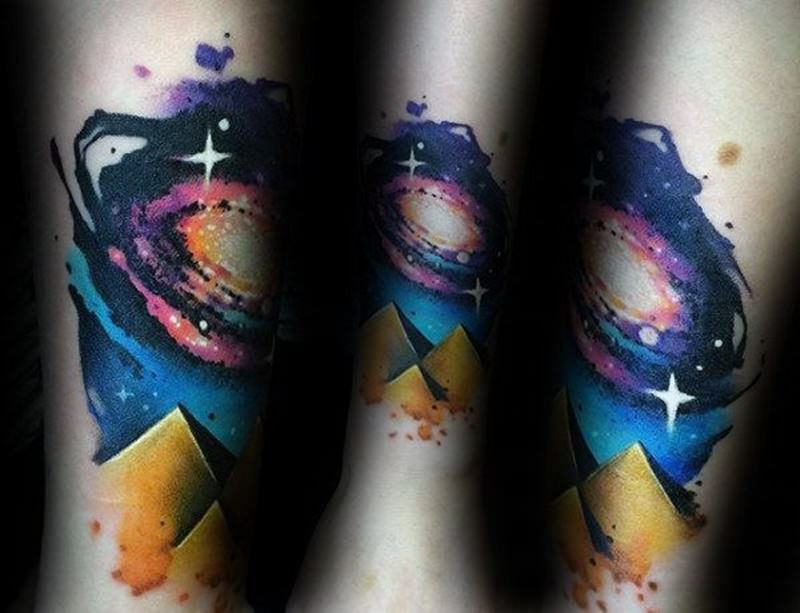 How could you not love a tattoo with so many beautiful colors in it? 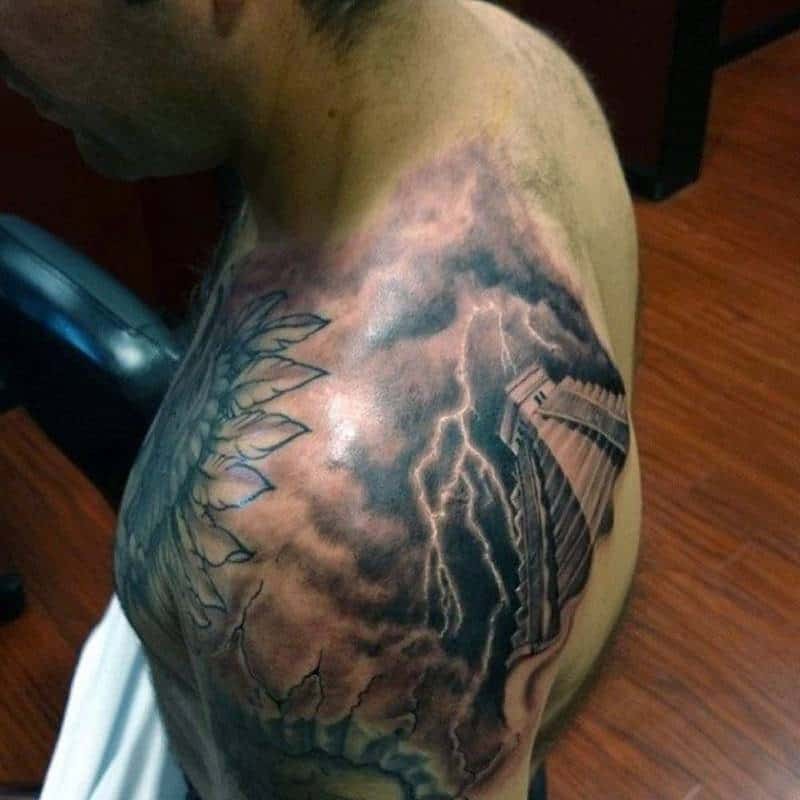 There appears to be a sandstorm in this tattoo design and maybe even a tornado. It’s definitely a cool image and one that you will want to keep around. This is likely one of the temples in China. It’s built much like a pyramid and serve as a spiritual ground as well. 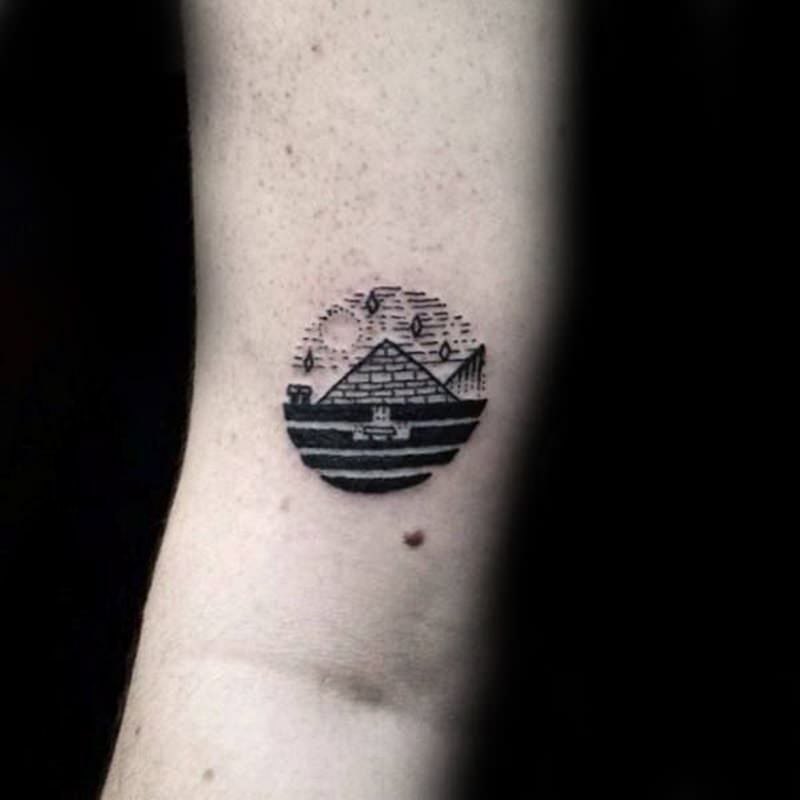 This is a very unusual tattoo design and that’s what makes it special. Try something new out and see how you like it. 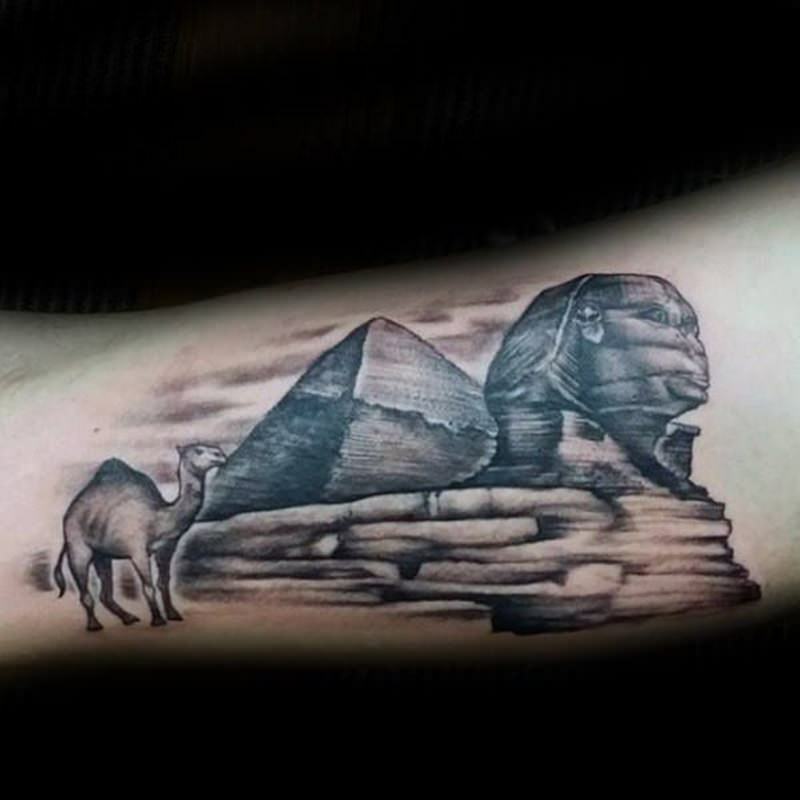 The tattoo is styled in a landscape design with the added touch of a camel. 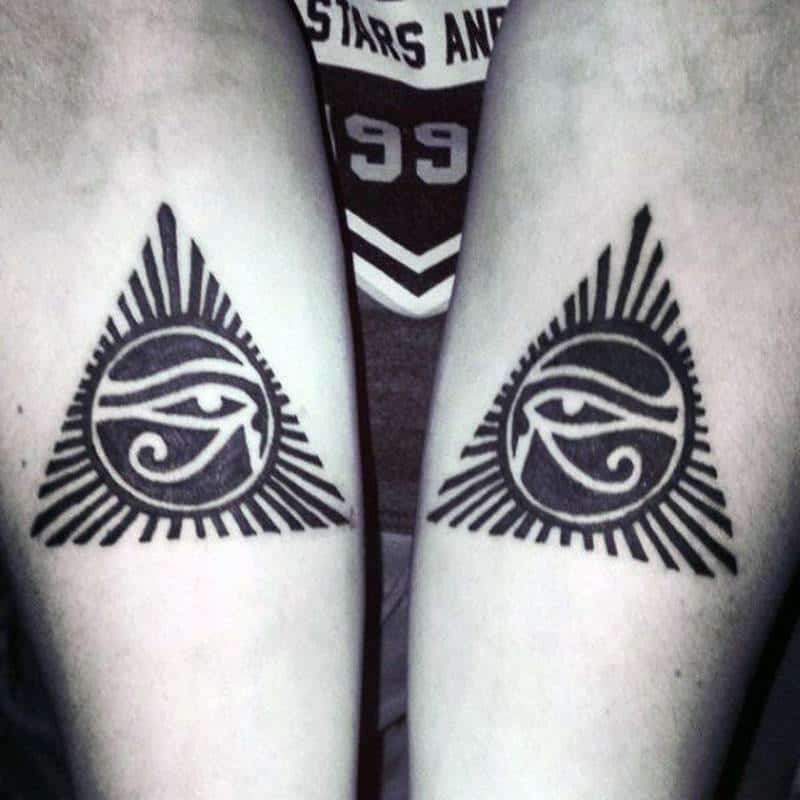 You can get matching styles on both arms or you can get matching styles with a friend. 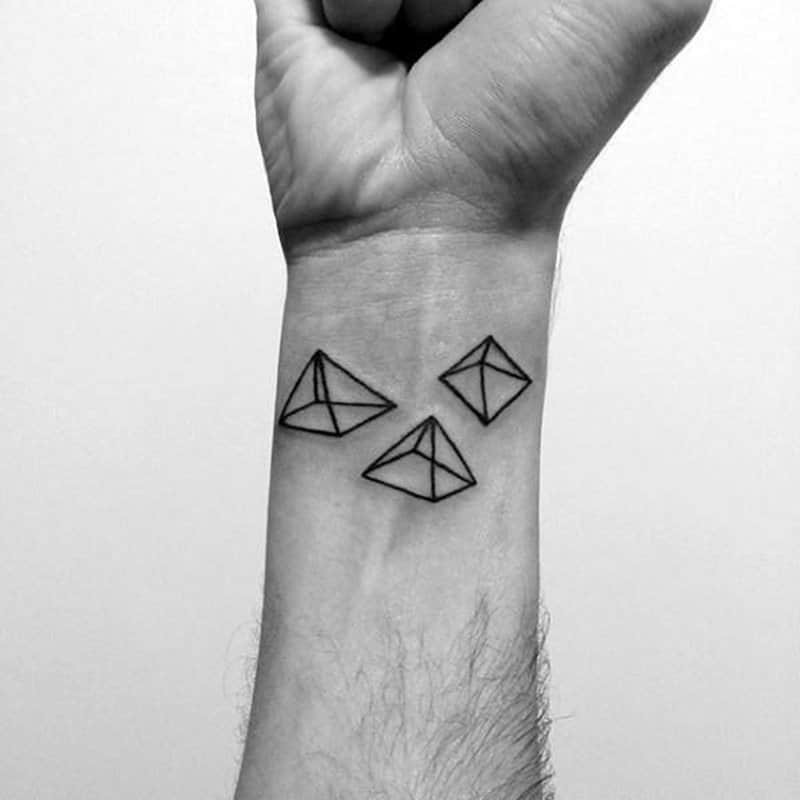 Another simple tattoo that you can put anywhere. Another cool cartoon image that you are sure to love. This detailed design is awesome in many ways. 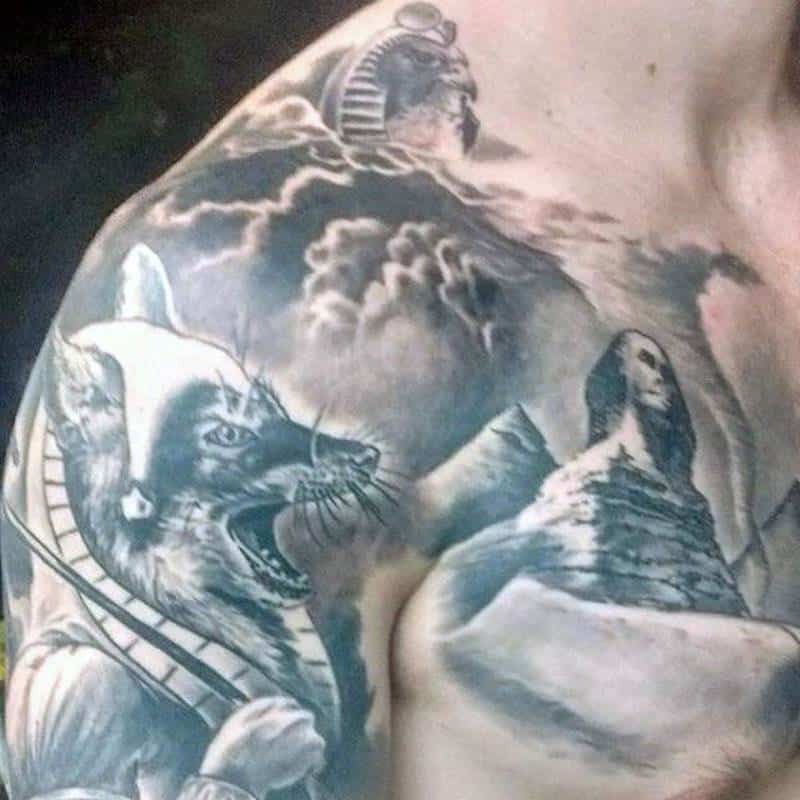 These warriors make for a great tattoo design. 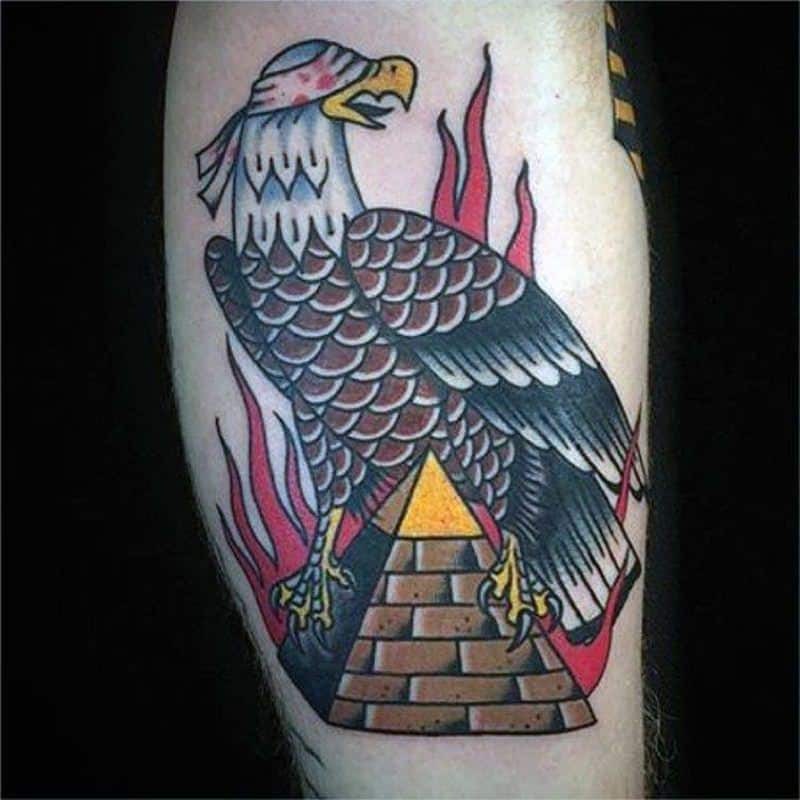 You are sure to love a tattoo as badass as this one. It’s cool and clean and totally one of a kind. Try it out for yourself.